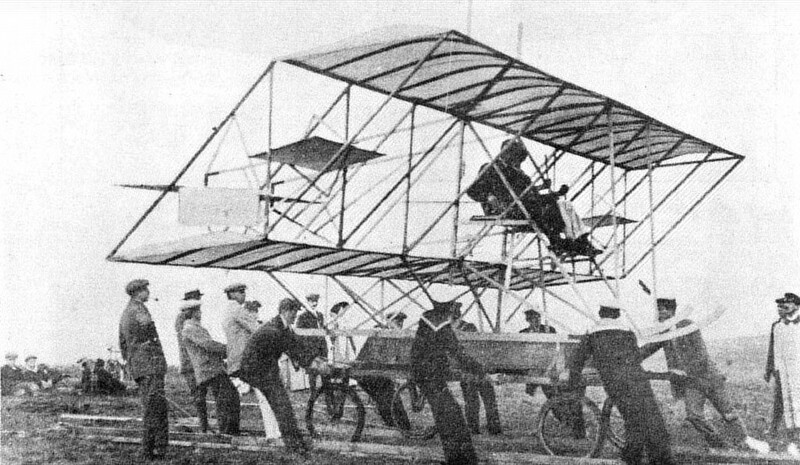 In 1909 the famous Bleriot XI was built. 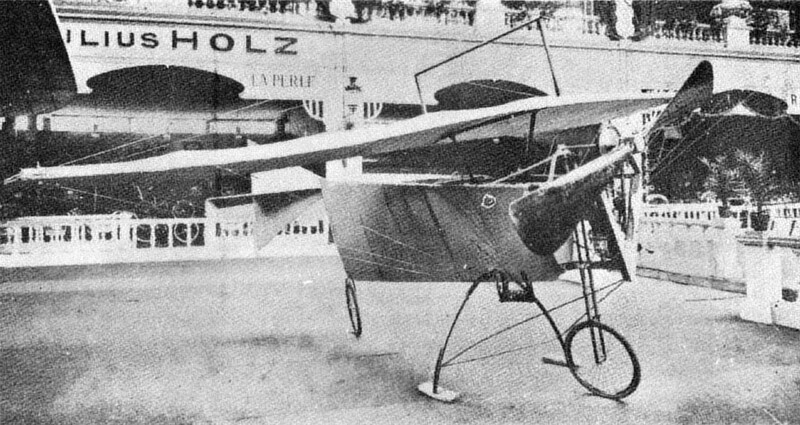 This did very well at Reims, 1909. 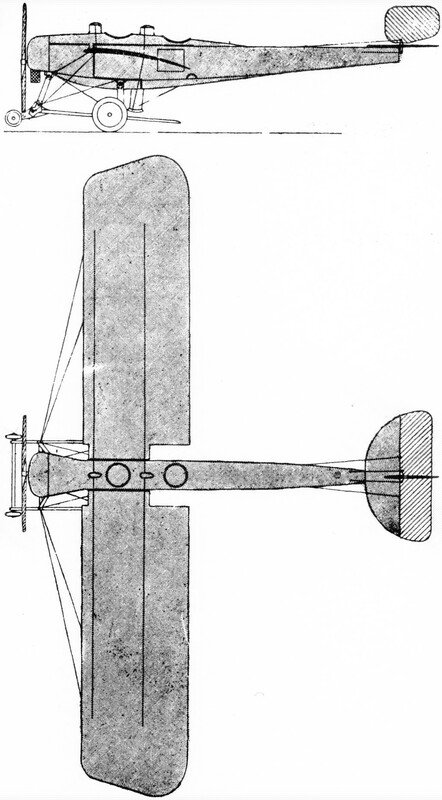 On 25th July, 1909, Bleriot made the first Cross-Channel flight in the machine illustrated below. 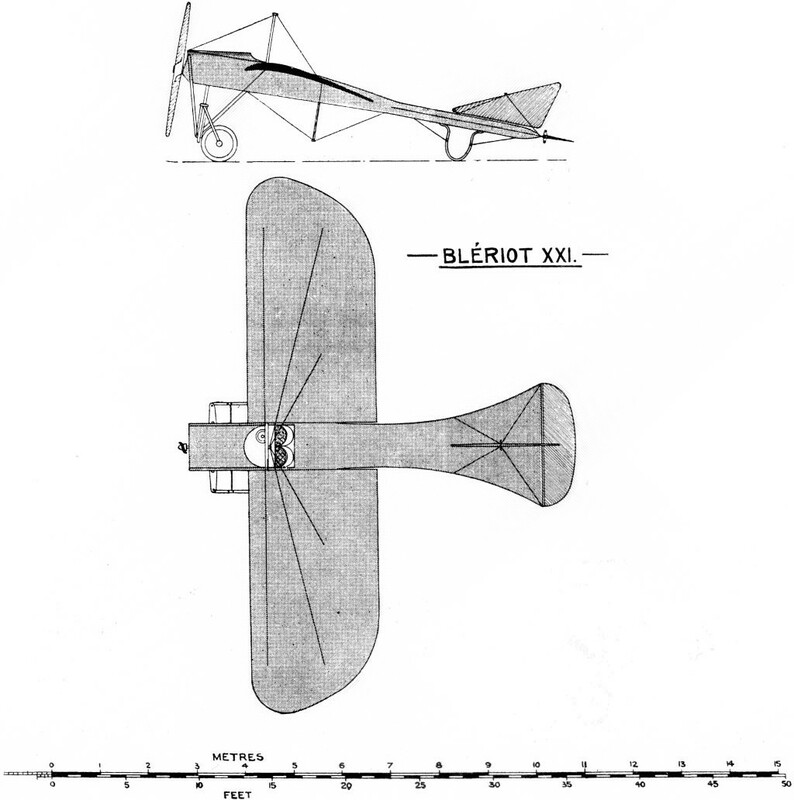 BLERIOT XI. This machine had length, 23 feet (7 m.) Span, 25? feet (7.80 m.) Area, 167 sq. feet (15? m?.) Aspect ratio 4? to 1. Motor, 22-25, 3 cylinder Anzani, Speed, about 45 m.p.h. (73 k.m.) 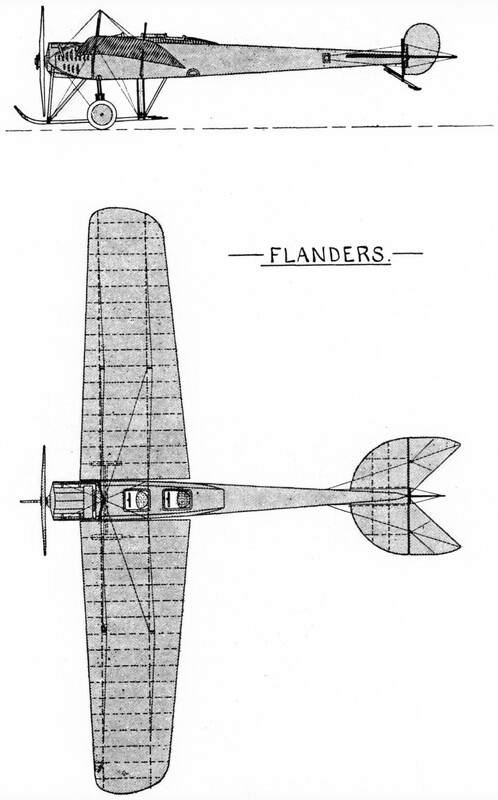 Special features: Fixed wings with rounded edges. Twin elevator and fixed surface tail. H. Farman. 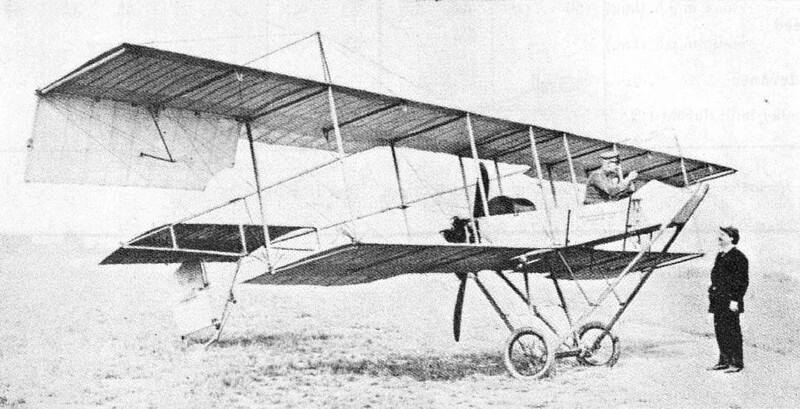 1912-1913 military biplane. 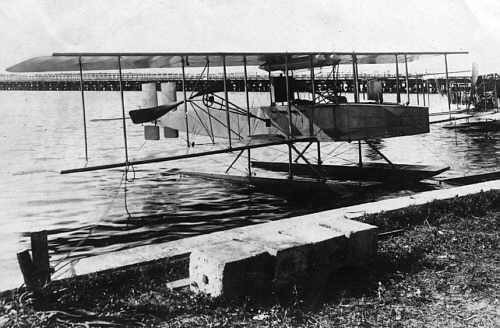 BURGESS-WRIGHT as a hydro (the U.S. Navy has two of these). HP Type E (HP5) in original 1912 form as a two-seater. 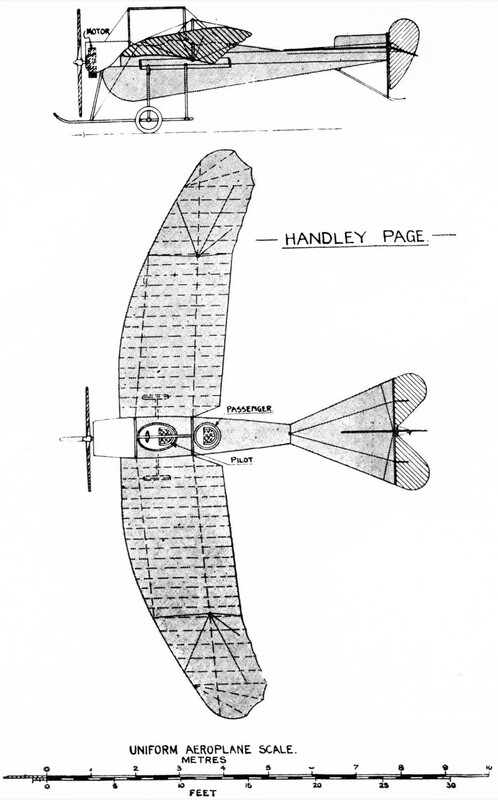 The 'bird-like' origins of some of the early designs can clearly be seen in the wing design of the Handley Page 'Yellow Peril'. No type ol this design entered service with the British military because of the monoplane ban. R.E.P. (1908). 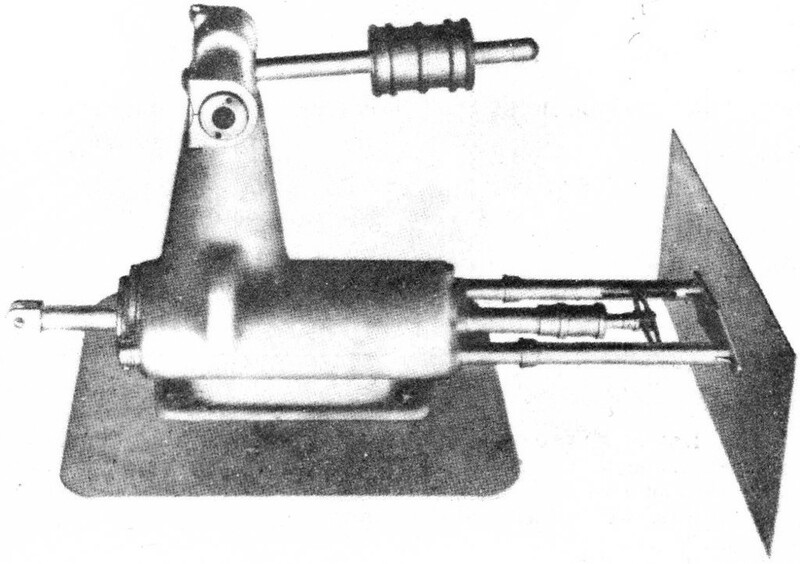 Early example of enclosed stream line body. Apparently the first machine in which steel construction appeared. 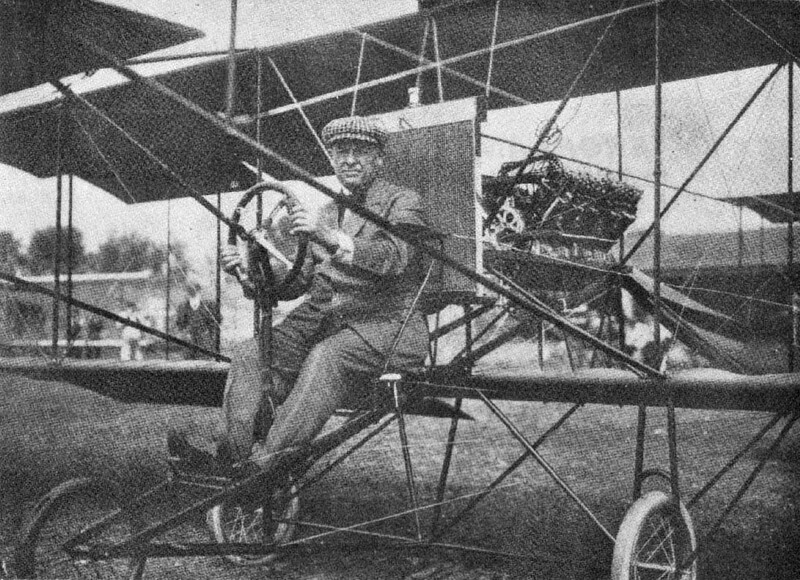 H. FARMAN (1907). 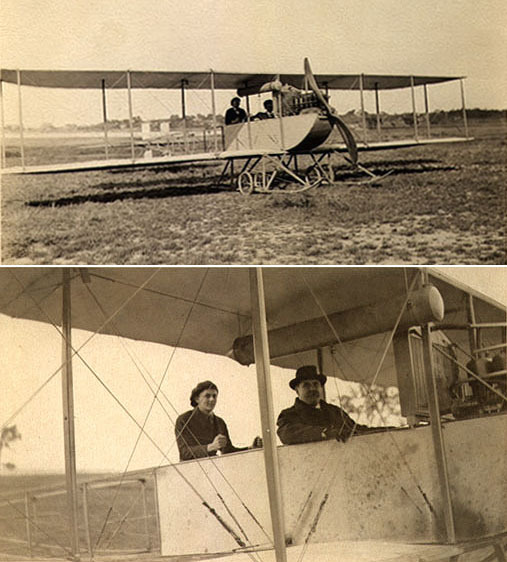 This famous machine is the first Voisin, and the one on which H. Farman taught himself to fly. It was the first machine to make a turn in the air. 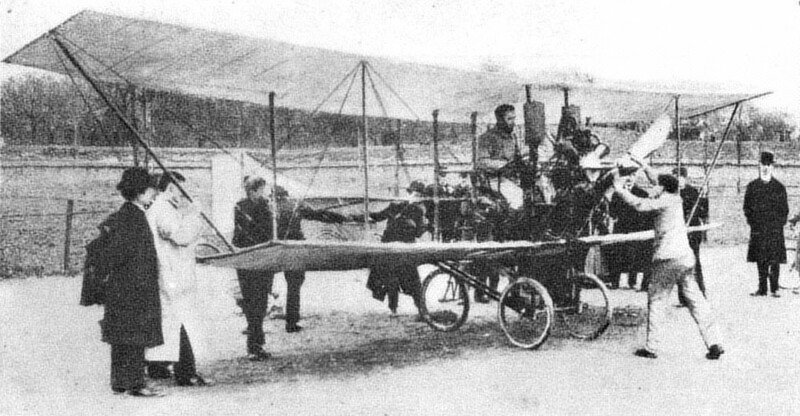 Won the Deutsh-Archdeacon Grand Prix, 13th January, 1908, with a flight of 1 minute, 28 seconds. The extra third plane was added later. An Austrian Syndicate subsequently bought the machine. 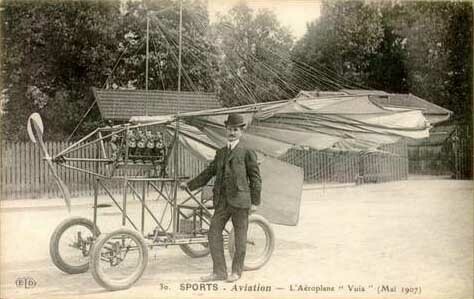 VOISIN (1908). The first European aeroplanes to fly with any real success. 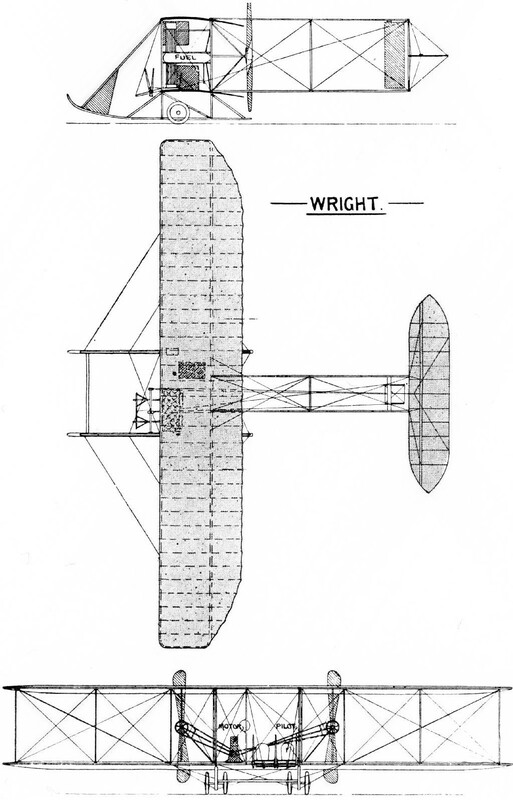 WRIGHT (1908). 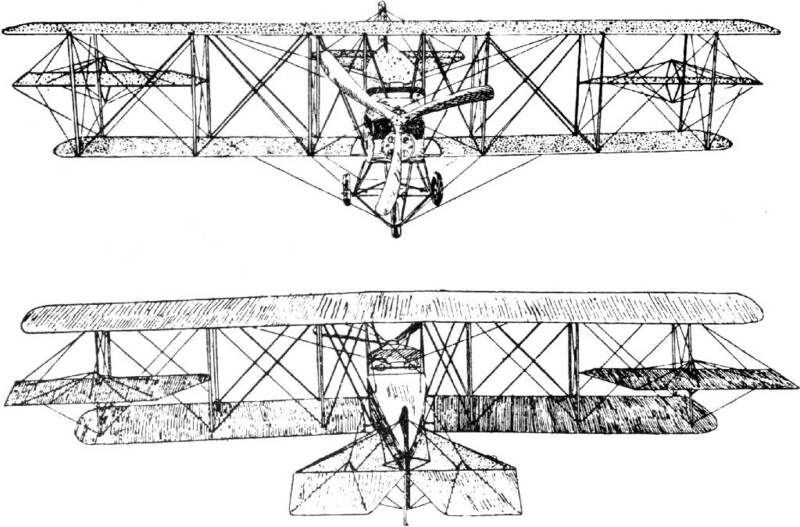 Two views of the machine with which Wilbur Wright started all Europe from August, 1908 to April, 1909. 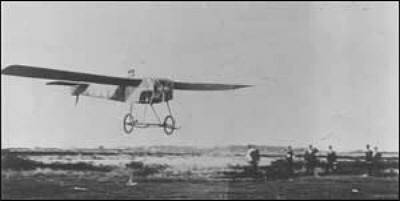 First U.S. machine to fly. JAPANESE AEROPLANES. Army Flying School ground. Bleriot (since wrecked), Tokogawa, Wright, Grade. ANTOINETTE IV (1909). 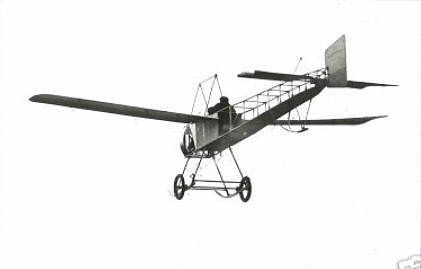 In this machine Latham made the first attempt to fly the Channel, 19th July, 1909. 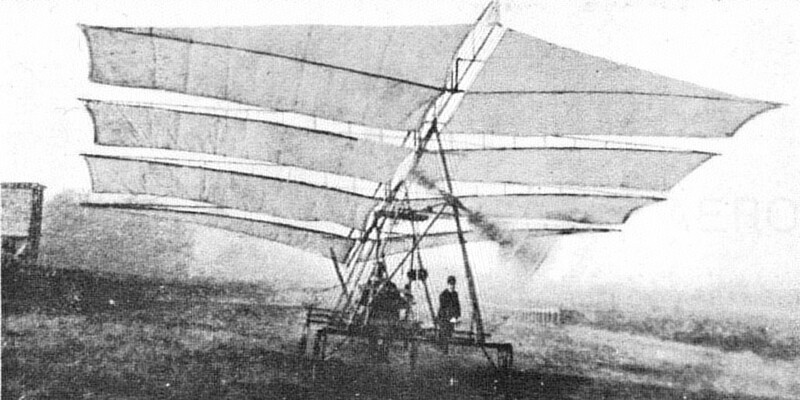 SANTOS-DUMONT XIX. This little machine, surface only 9 m2. made an extraordinary sensation in France in 1909. It flew at the then incredible speed of 65 m.p.h. (100 k.p.h.) Santos-Dumont presented all rights to the world soon afterwards, and a large number were built before it was realised that only an extremely light weight pilot could fly in one. Few of the copies ever left the ground. WITZIG-LIORE-DUTILLUEL (1908-09). 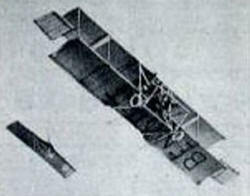 First or one of the first appearances of the idea of a series of staggered planes, with which Sellers has ever since experimented in the U.S.A.
BREGUET IV (1910). On its appearance, this machine was generally laughed at and nicknamed the "Coffee Pot," till in Aug., 1910, it made a world's record by carrying six, and later proved itself superior in stability to anything then existing. DE LA HAULT (1907). 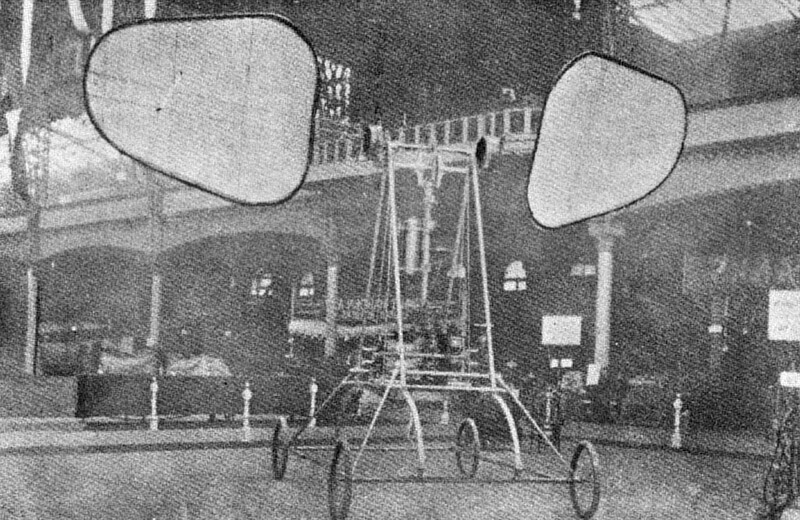 One of the earliest attempts at an ornithopter. No flights. CYGNET II (1908). 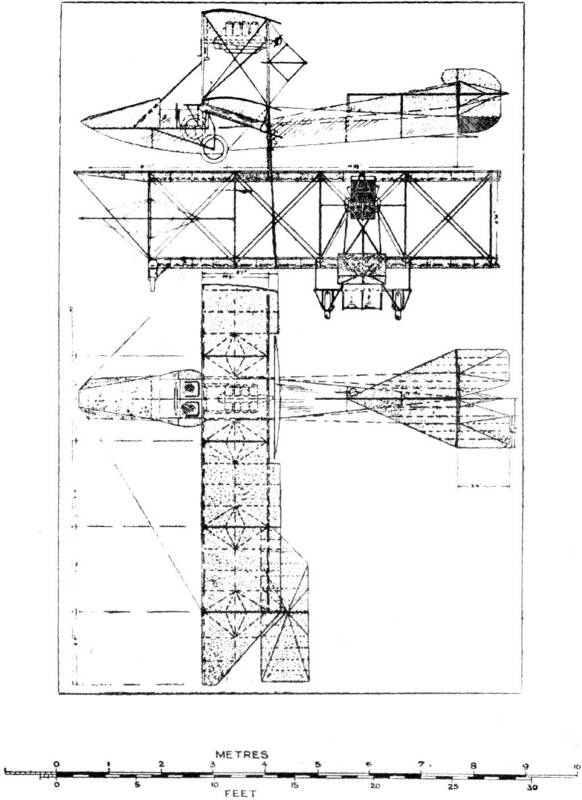 Designed by Dr. Graham Bell, of the Aeronautical Society of America. Bell (Canadian), Glen Curtis (U.S.), Herring (U.S.), and Burgess (Canadian). It made short flights. JUNE BUG (1908-09). Famous machine of its era. 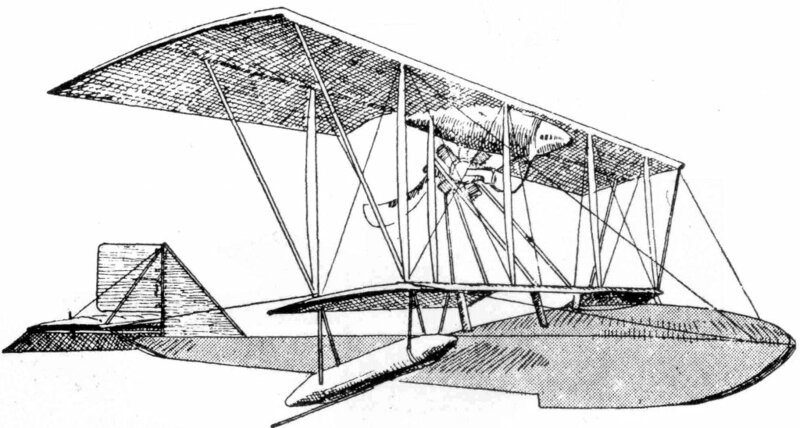 Built by the Aeronautical Society of America (see Cygnet II). 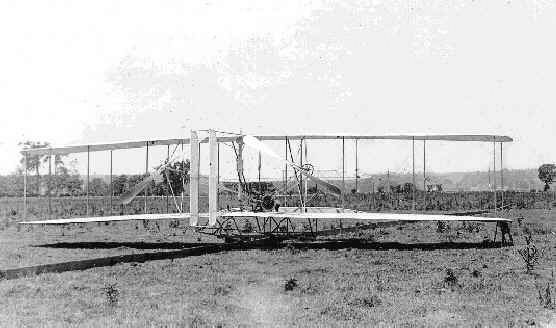 Second machine to fly in the U.S.A. Did 2000 miles before being broken up. 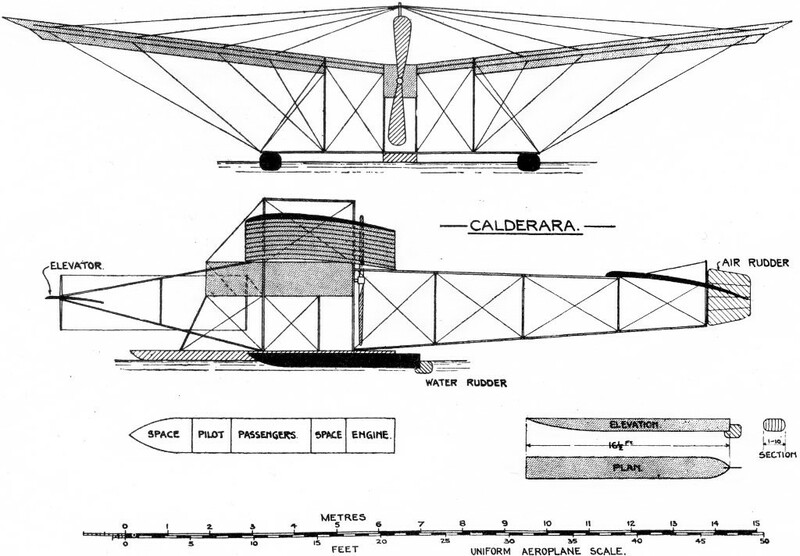 BOKOR TRIPLANE. 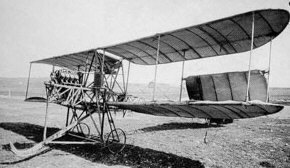 - In this American design the double triangular-shaped tail and the swinging aviator's seat, which automatically warps the lower plane, are the main features. BOKOR (1909). 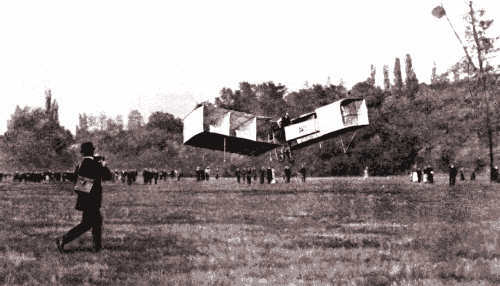 The third American machine to leave the ground; the second purely U.S. one. KIMBALL (1909). 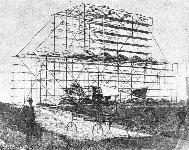 First machine in which a large number of propellers was attempted. Failed. PORTE (1908). Designed by Lieut. Porte, R.N., in conjunction with Lieut. Pirie, R.N. 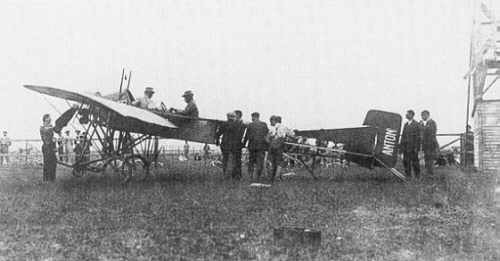 This machine, on which the former well known aviator commenced his flying career, was smashed up in preliminary trials as a glider on Portsdown Hill, Portsmouth. Its design apparently preceded the Goupy in the use of staggered planes. MILLER (1908-09). 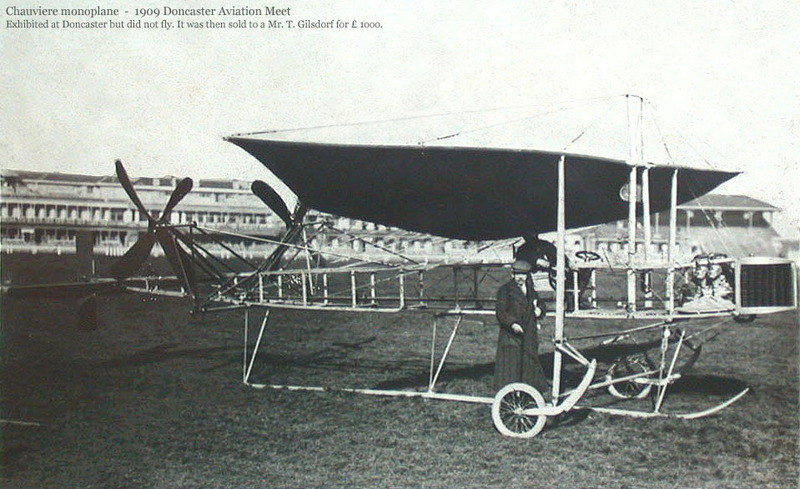 First aeroplane to be designed and constructed by Italians. DUNNE, U.A.S. 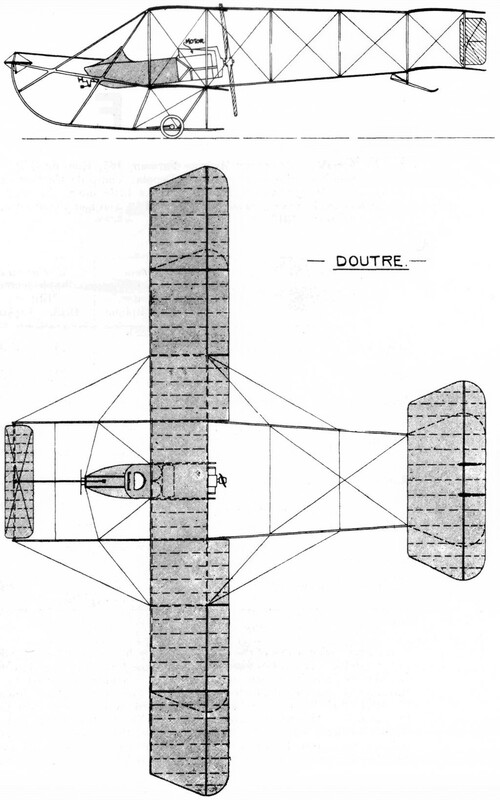 Original Dunne biplane D5. GABARDINI (1909-10). 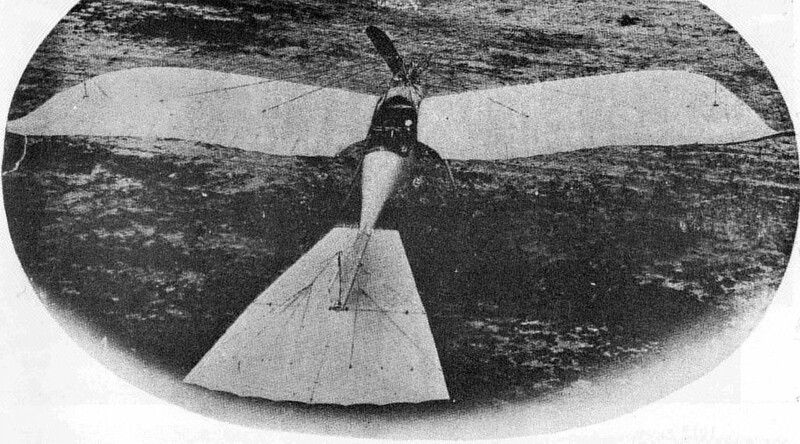 Very early hydro-aeroplane, antedating the Fabre. HUNTINGDON (DUNNE II) (1910). 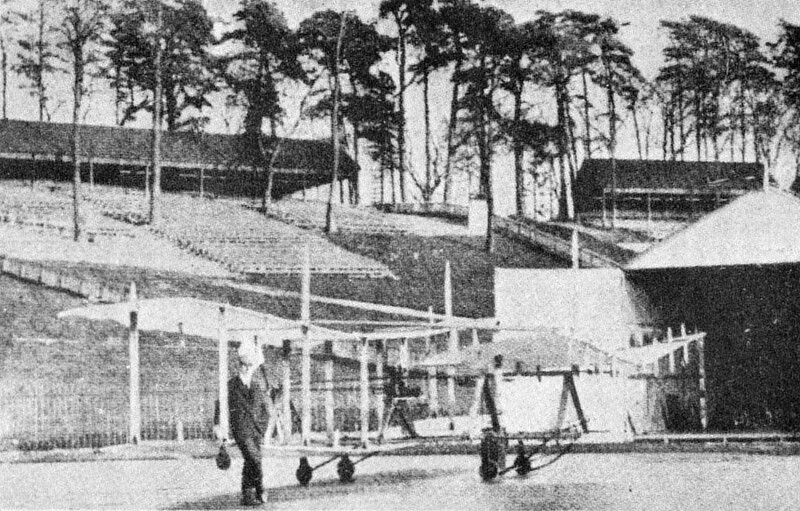 One of the earliest aeroplanes in existence--designed by Captain Dunne about 1905-06, previous to the secret experiments of the British War Office in Scotland, on the Duke of Atholl's estate. Assigned to Prof. Huntingdon in 1910. Made a few short flights. CODY (1909). Development of a much earlier machine. 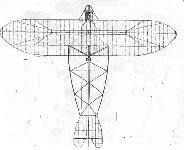 This one was a general laughing stock for a long time; but it was the direct predecessor of the machine (not very materially different) which was an easy first in the British Army aeroplane trials, 1912. SEDDON. (1910). Designed by Lieut. Seddon, R.N. 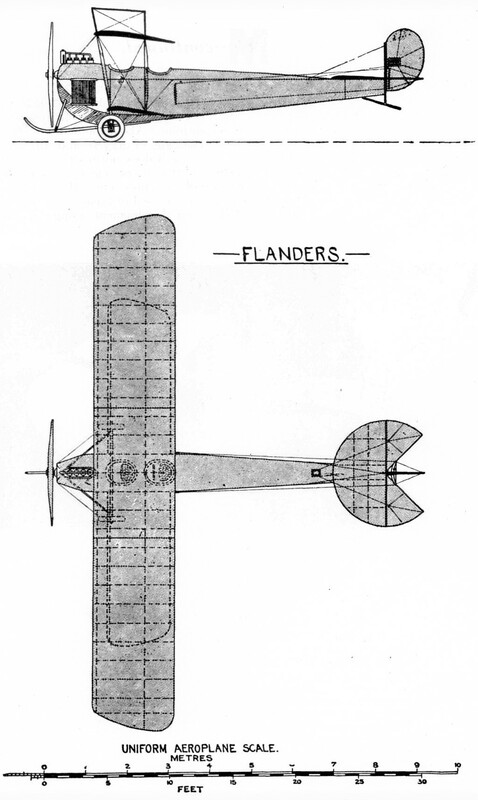 Type D (1911). Photo, Alan H. Burgoyne, Esq., M.P. 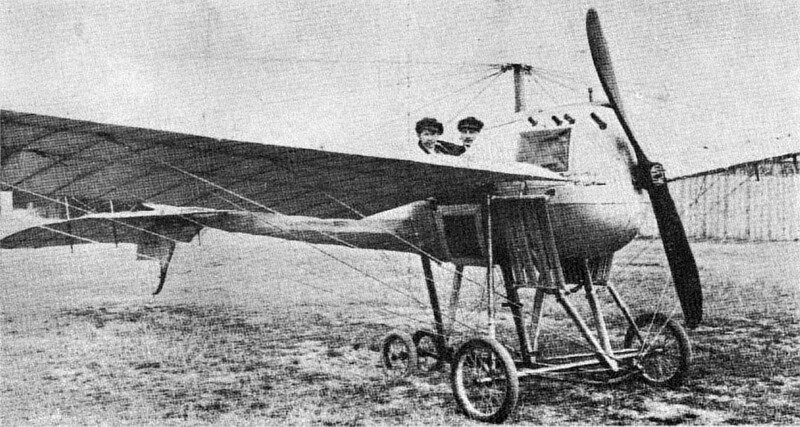 Avro. 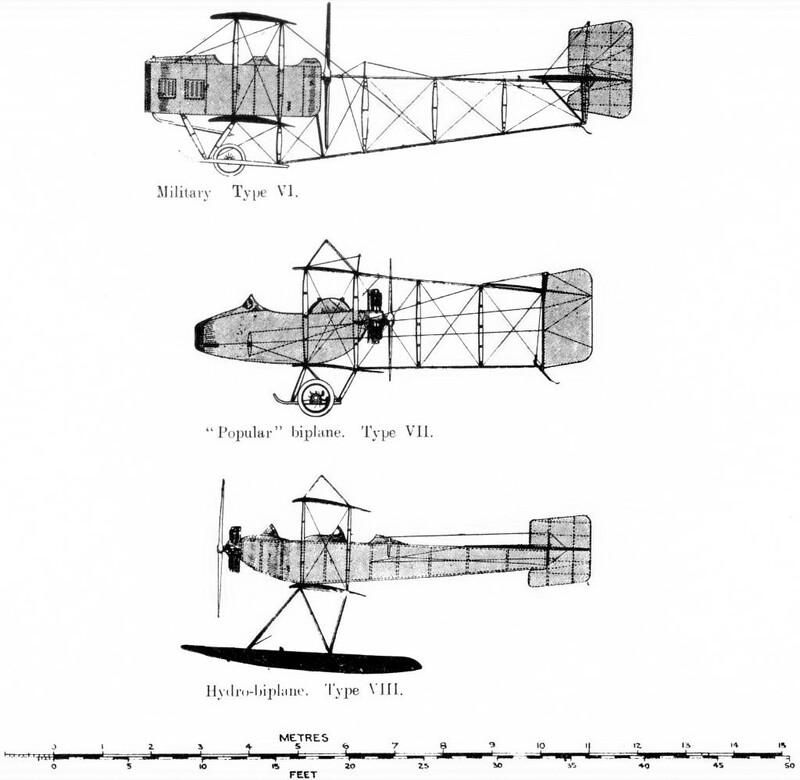 Type D (1911-12)., x1, U.A.S. M. Farman. 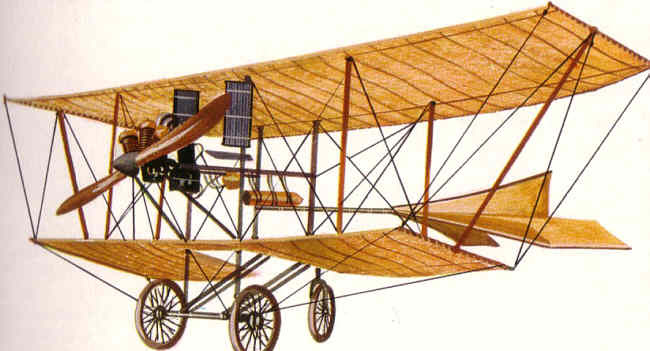 1912-1913 military biplane. 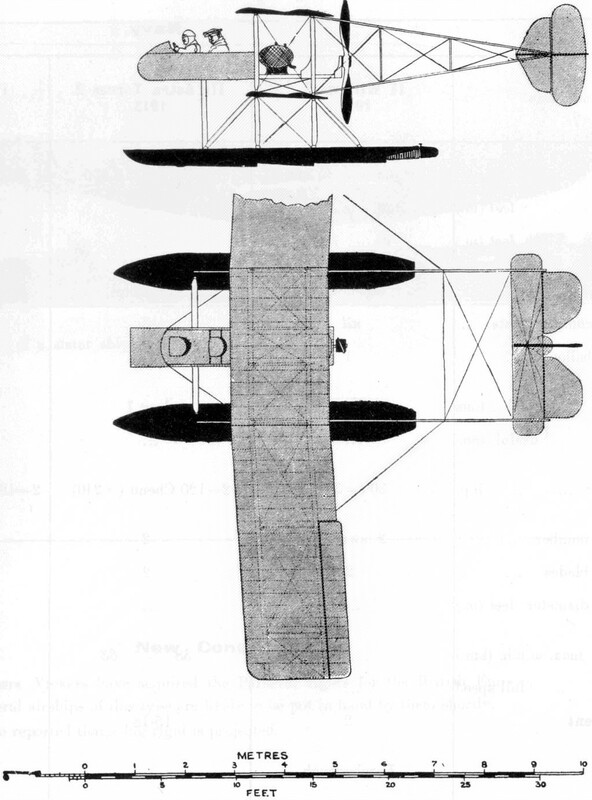 The Type XXVII, similar to the XXI. 1912-13. G3 type 3-seater military. 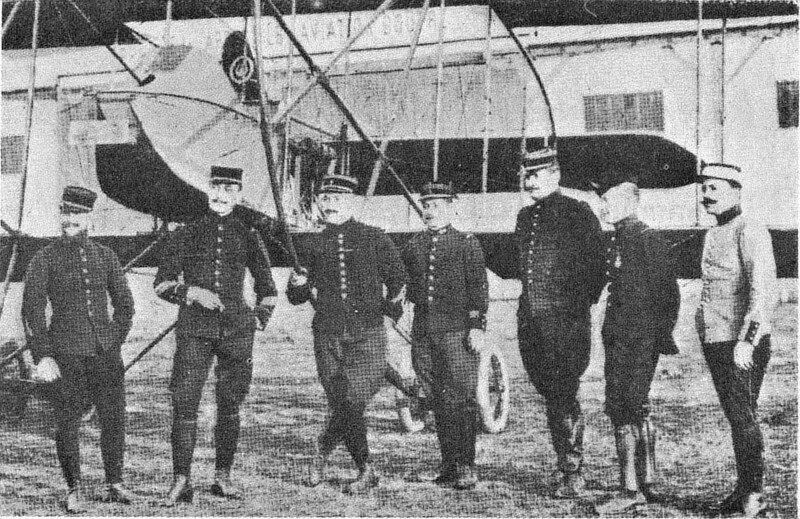 1913 type of XI bis. UAS. M. Farman. 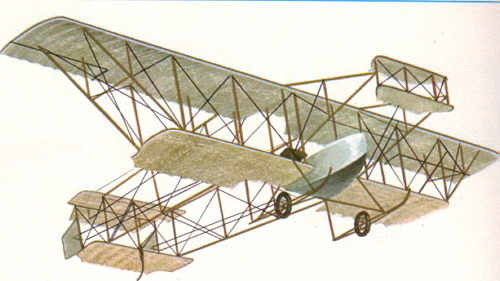 1912-13 staggered biplane. This is the type which has done best as a hydro-aeroplane. 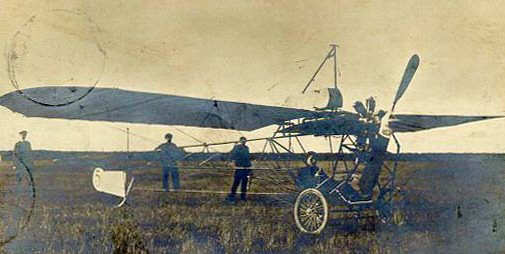 BLERIOT-LIMOUSINE.-- View from left side, x3, UAS. 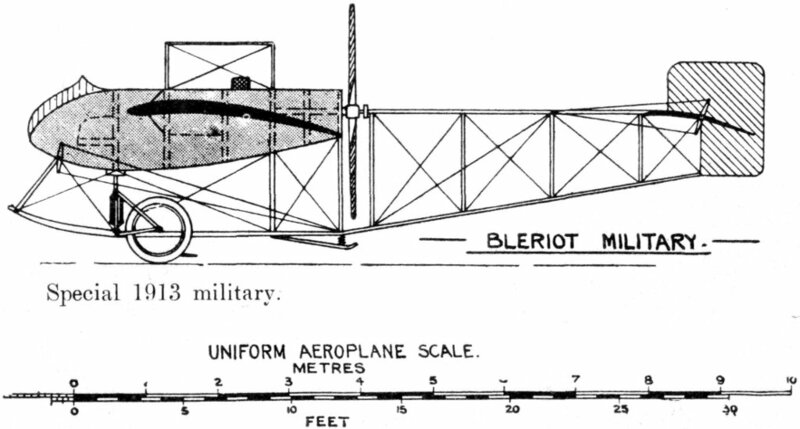 General standard type of Bleriot 1912 & 1913. UAS. 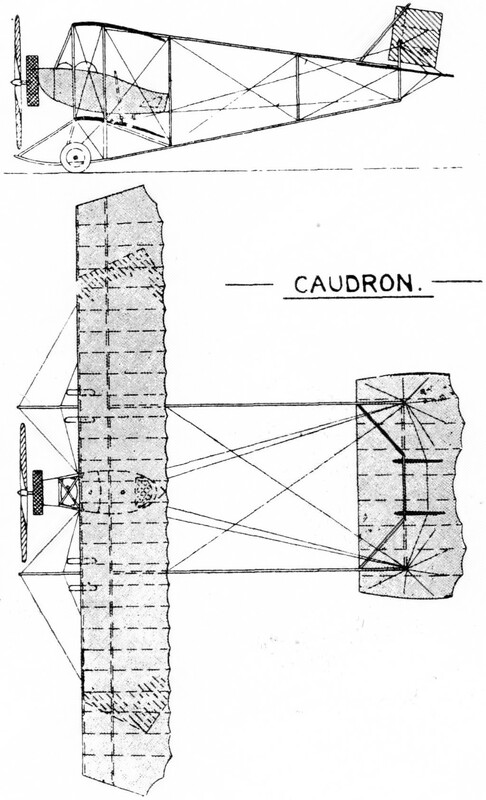 CAUDRON Mono. By favour of "Flight". B.E. type. R.A.F. 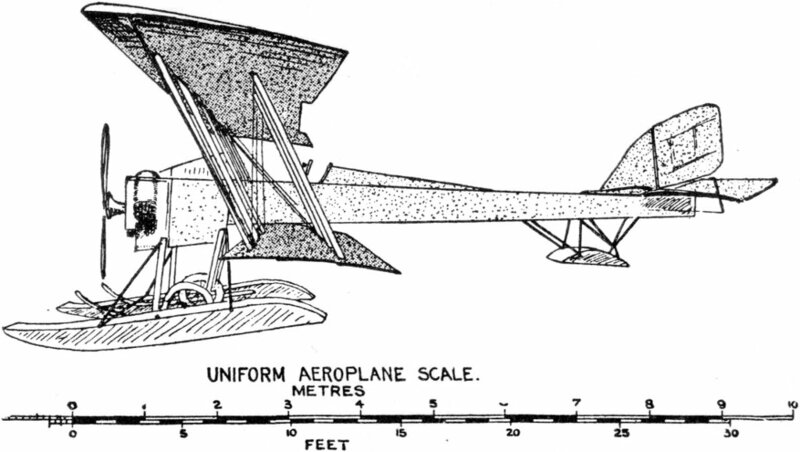 Uniform Aeroplane Scale. SWEDISH AEROPLANES. Nyrop. 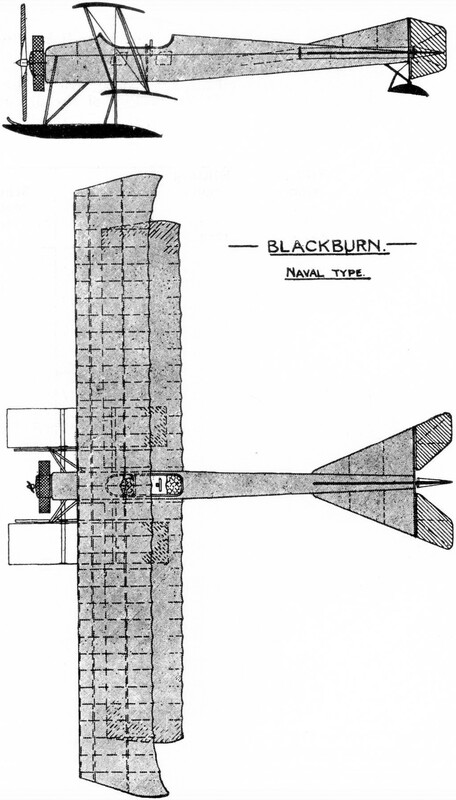 Naval monoplane. 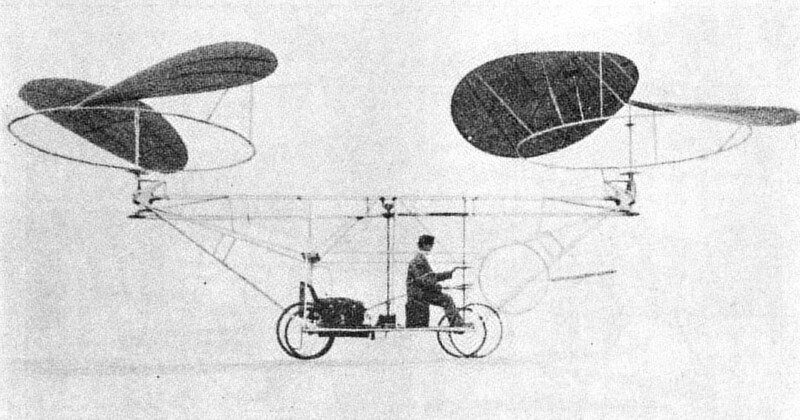 Bleriot 2-seater. 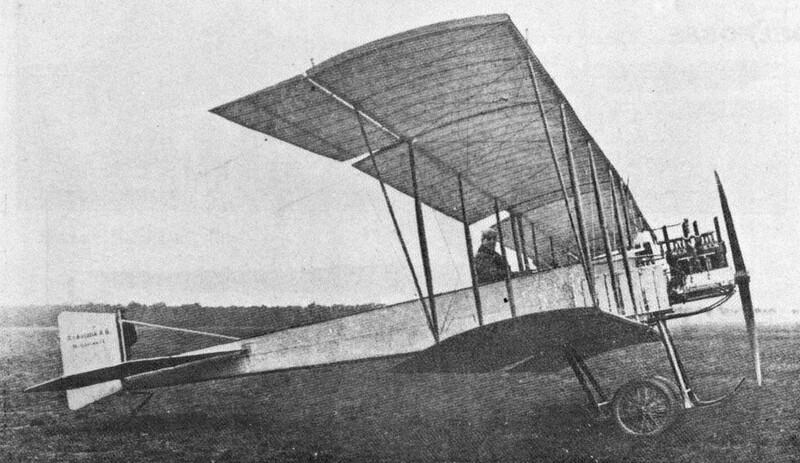 Built in Sweden by Nyrop, 1911. Motor, 50 h.p. Gnome. F type Enclosed Avro Mono. 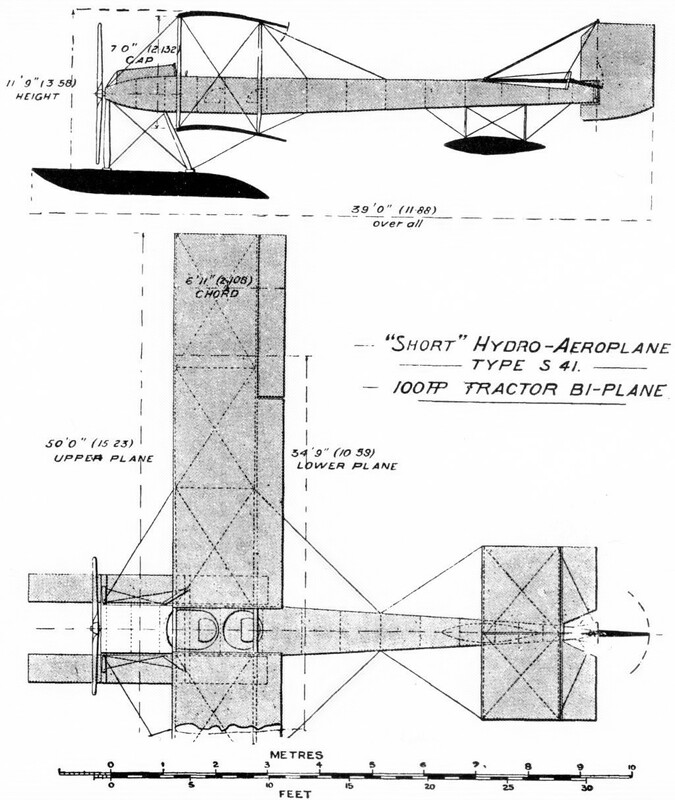 "Short" Hydro Aeroplane Type S.41 100 h.p. tractor biplane. Illustration: Photograph from right, partially obscured. Caption: ETRICH. Limousine. Photo, Guld. 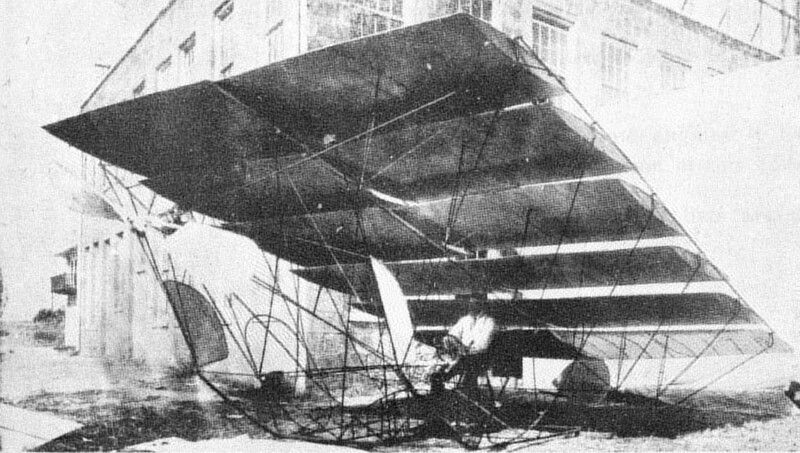 THE "MARTINSYDE" 120 H.P. 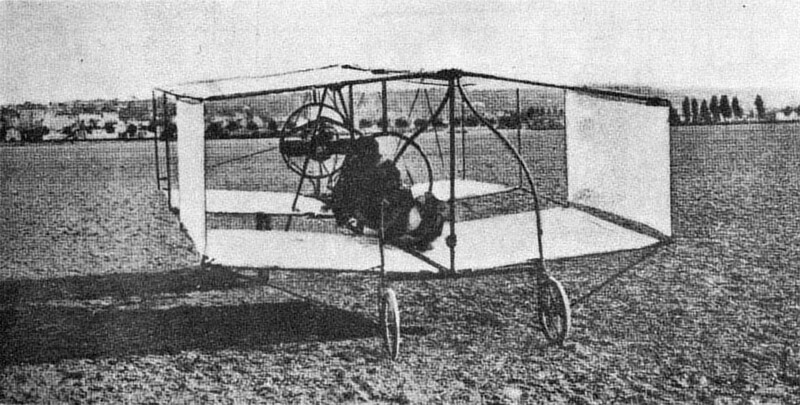 TWO-SEATER, MILITARY TYPE MONOPLANE. Fuel Capacity for 6 HOURS' FLIGHT, at 85 miles per hour. 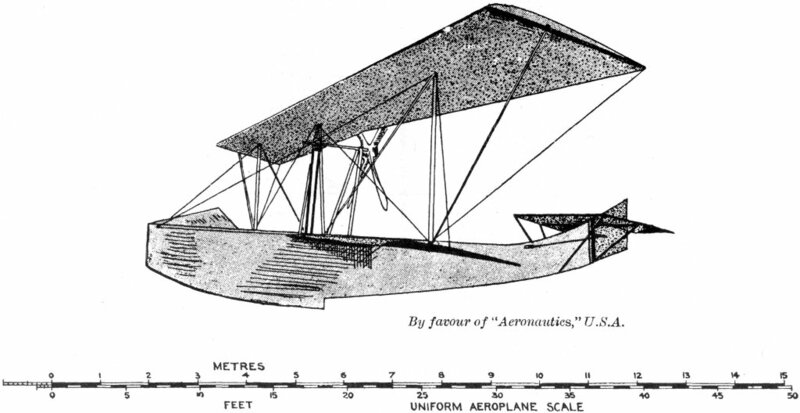 By favour of "Aeronautics," U.S.A.
Avro G at the Military Trials. No. 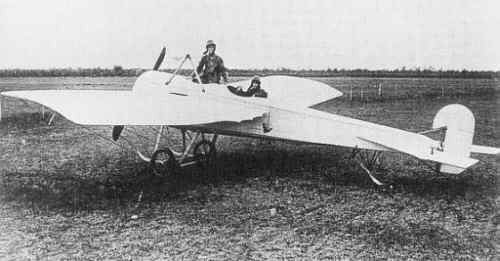 6 monoplane re-engined with a 70 hp Gnome and with a Levasseur-type propeller. H. Farman. 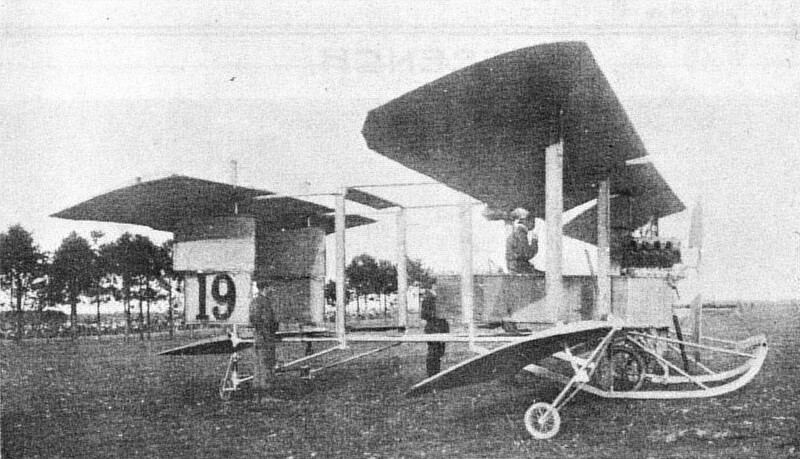 1913 latest type military biplane. 1913 Borel. 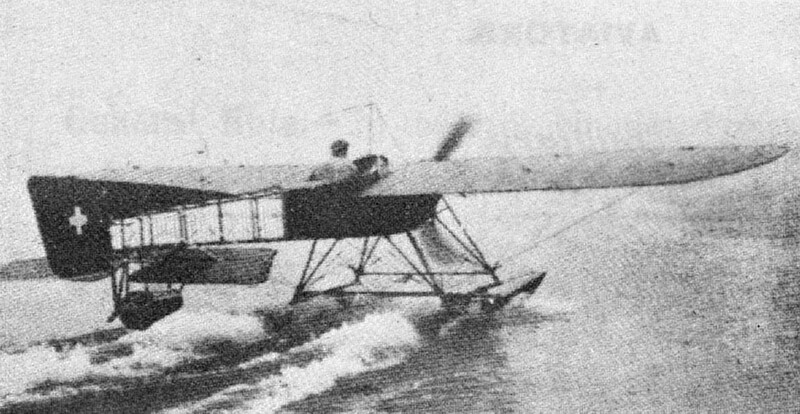 Hydro-avion. By favour of "Flight." GOUPY. Hydro. By favour of "Aeronautics," U.S.A.
NIEUPORT. Hydro. By favour of "Flight." UAS. 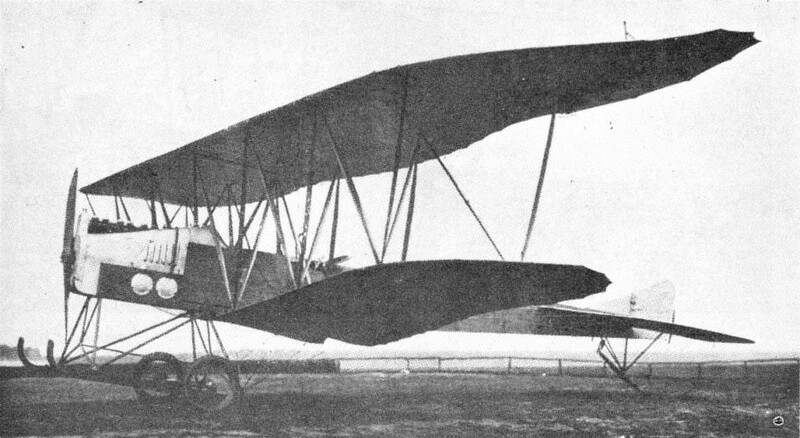 "Popular" biplane. 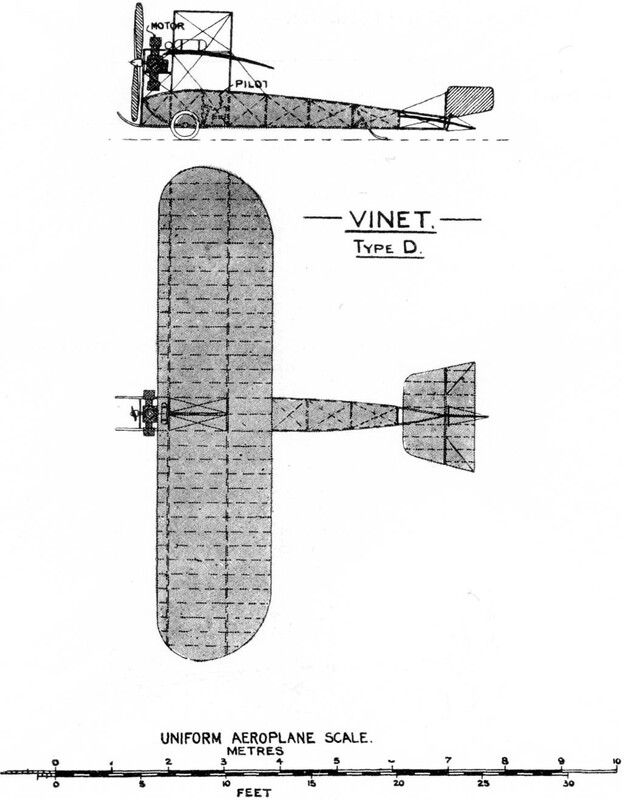 Type VII. UAS. The 80 h.p. mounted on floats as a hydro. E type Standard 50 h.p. 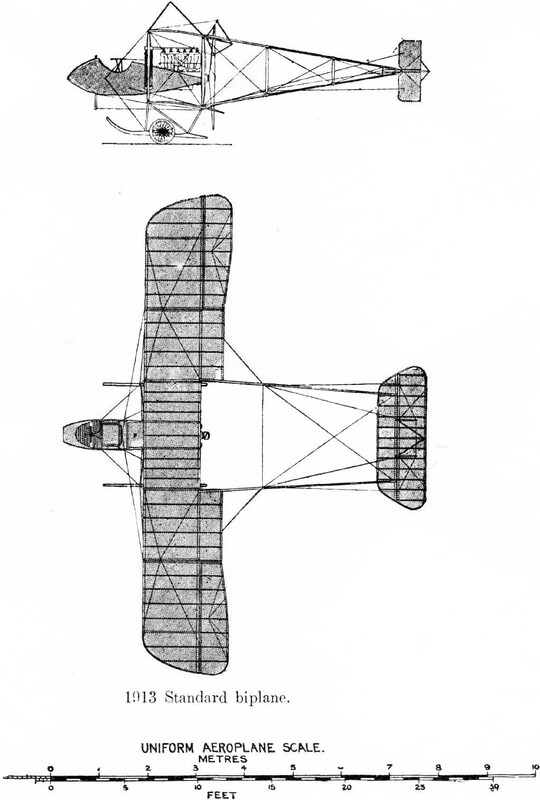 Avro Biplane. 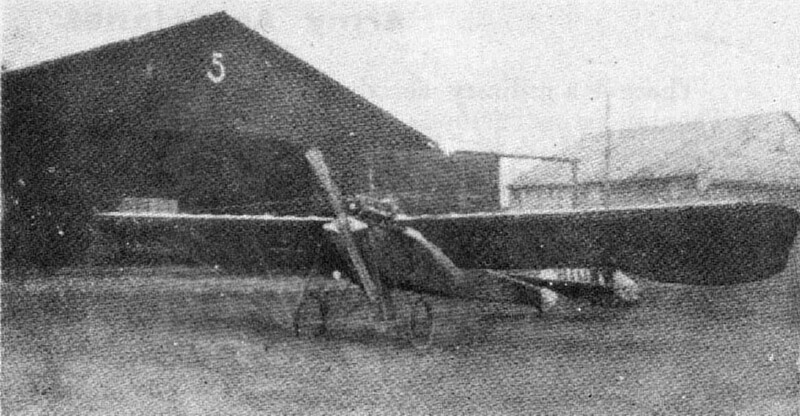 The latest type 60-h.p, Gnome Blackburn monoplane with which Mr. Cyril Foggin, together with Mr. Harold Blackburn, has been giving exhibitions in Leeds at Easter. 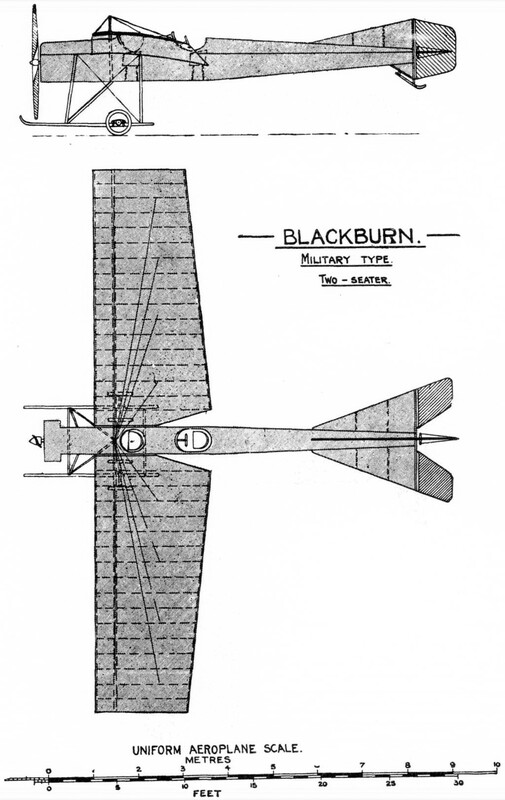 This new Blackburn model has shown some excellent flying qualities, and is very stable in adverse winds. It is a quick climber, and has a fine turn of speed. 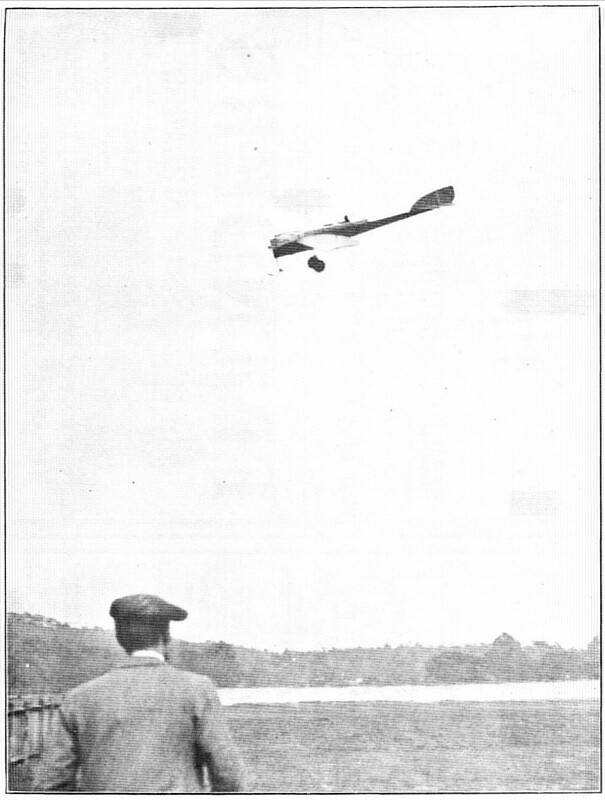 The Burgess flying boat in flight. 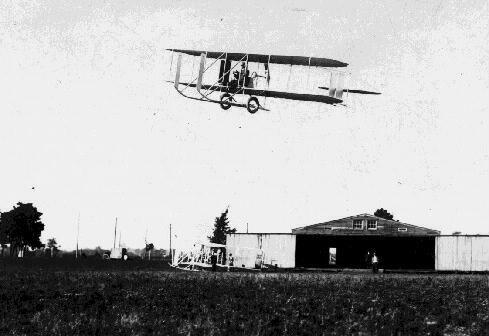 Unquestinably the most famous aviation photograph ever taken, this study shows the Flyer making the first of its four flights of 17 December 1903, with Orville piloting and Wilbur at the wingtip. Orville had set up the camera on its tripod, and the shutter was operated by John T Daniels of the Kill Devil Life Saving Station. 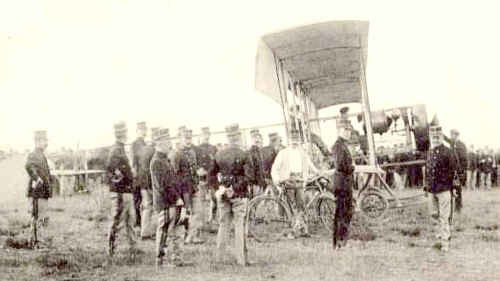 Orville Wright, the pilot in this historic picture, taken at 10.35am, Thursday, 17 December 1903, claimed this 12-second flight as ‘the first in the history of the world in which a machine carrying a man had raised itself by its own power into the air in full flight, had sailed forward without reduction of speed, and had finally landed at a point as high as that from which it started’. 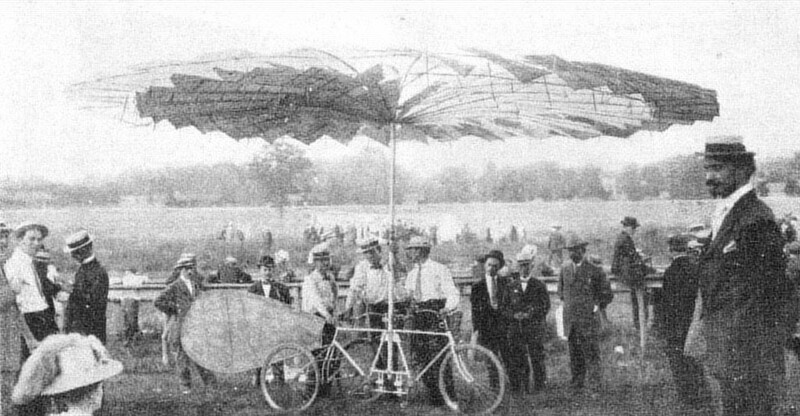 1904 Wright Flyer 2 - almost identical to Flyer 1 but heavier. Country of origin: USA. 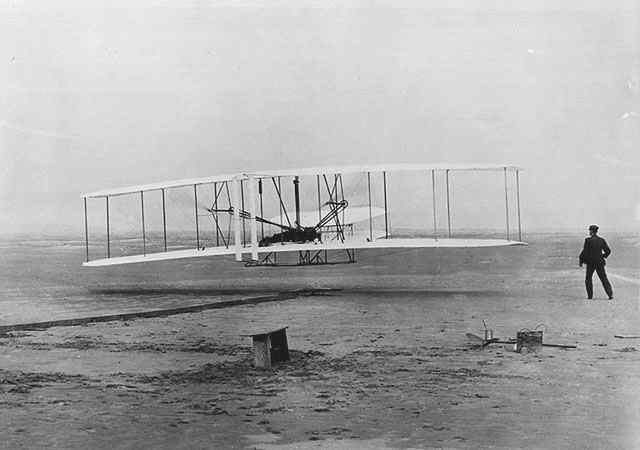 Designed and built by Wilbur & Orville Wright. Country of origin: France/Brazil. Designer: Alberto Santos-Dumont, Brazilian living in France. 1912 hydro. 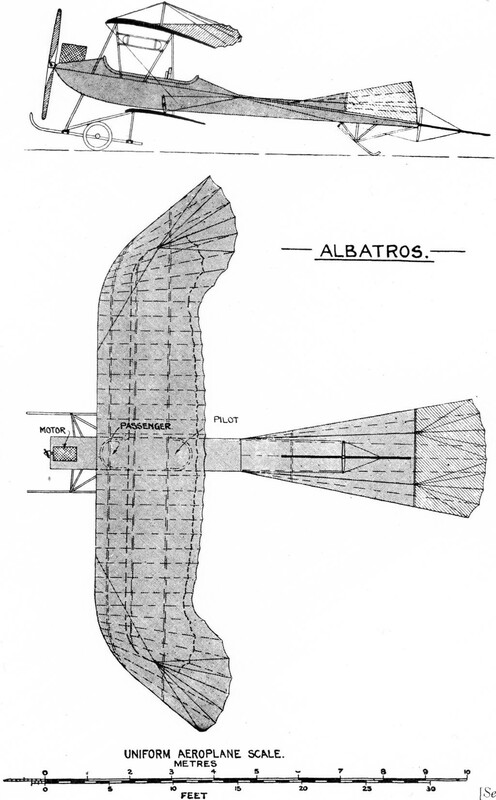 By favour of "Aeronautics," U.S.A., UAS. 1913 Wright Model E - similar to EX, except only one 7' pusher and 2 large 24" balloon tires. Span: 36' Length: 27.9' Weight: 730 lbs. JAPANESE AEROPLANES. Tokogawa II. Type I the same except for minor details. SWEDISH AEROPLANES. Ask. Monoplane. Harlan type. 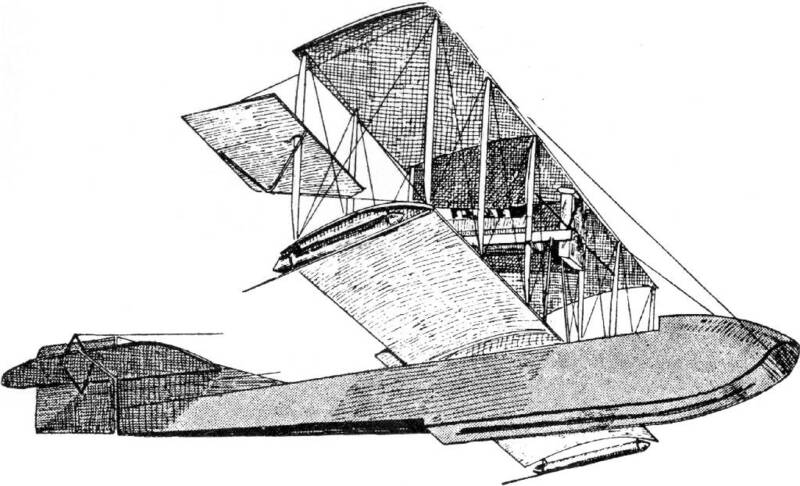 Built by Ask, 1911. SWEDISH AEROPLANES. Dahlbek. 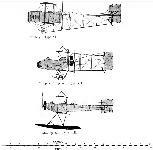 Farman type. Built by Lieut. Dahlbek. 1913. 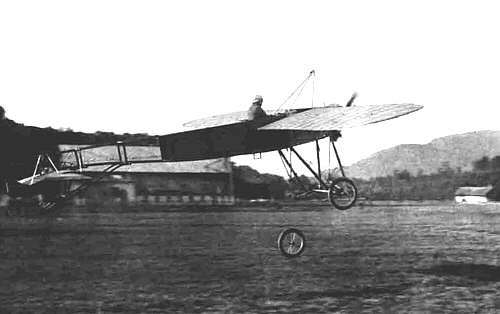 1911 Taddeoli monoplane - he lost a wheel on take off in Berne! Country of Origin: USA Designed by Thomas W.Benoist and built by Benoist Aircraft Co.
HIPPICH (1908). 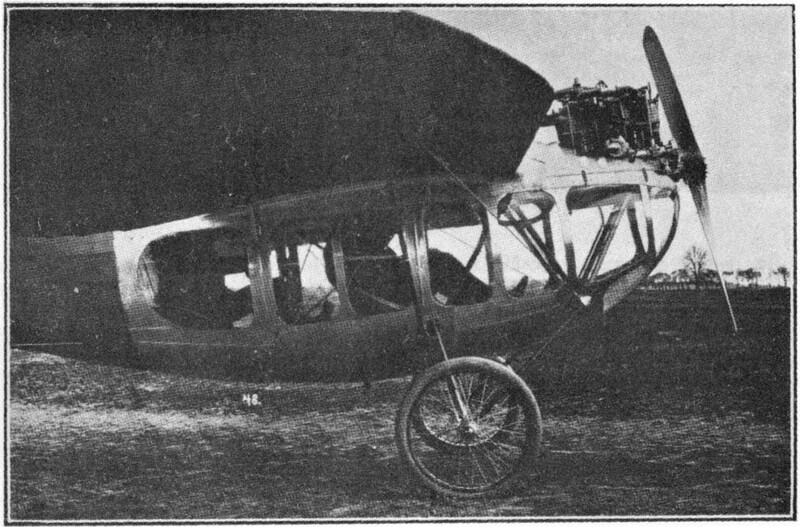 Tandem mono, with one propeller befora and another in rear of rear plane. NEMETHY (1908). The first "Aviette." SOLTAU (1910). 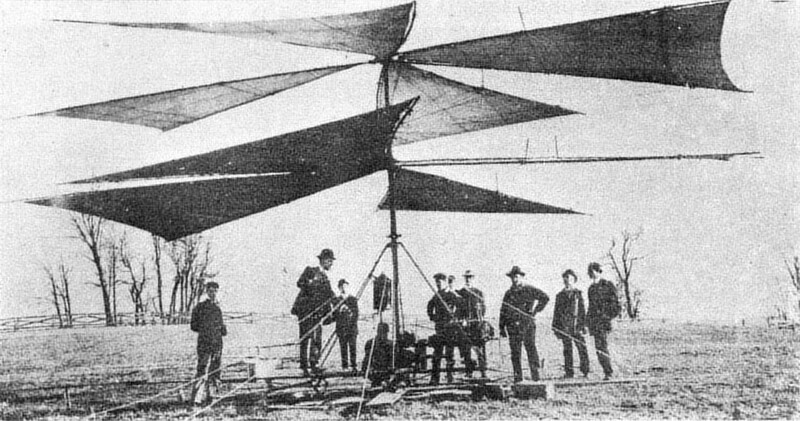 An ornithopter based on earlier ideas of Adhemar de la Hault (see BELGIUM). DE LA HAULT II. (1910-11). 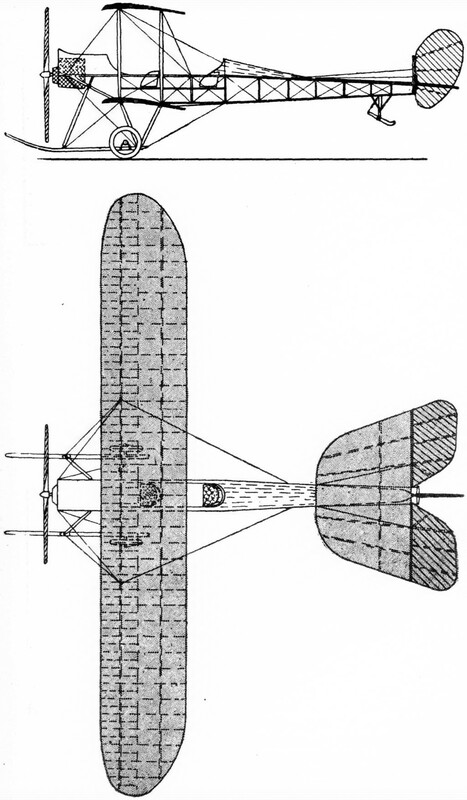 The ornithopter principle applied to a monoplane. No success met with. D'HESPEL (1909-10). 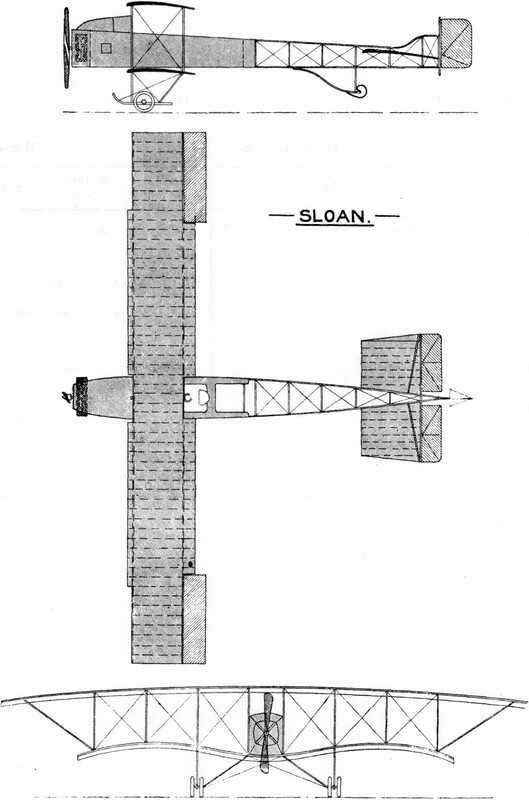 Single plane and suspended body. 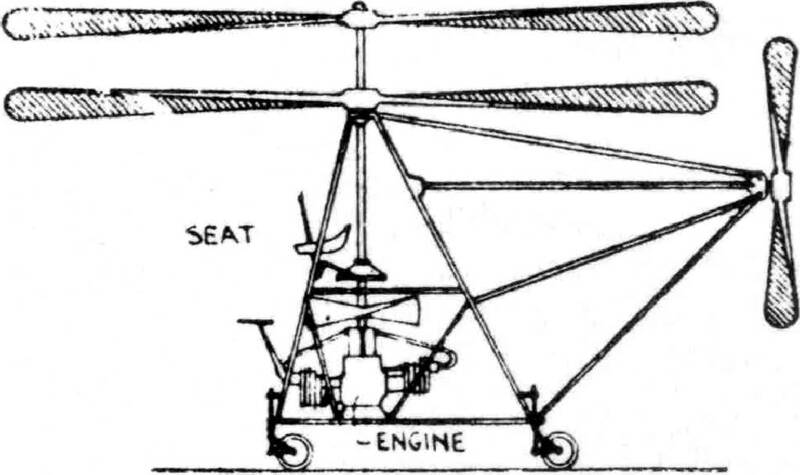 Early example of enclosed body. No flights. 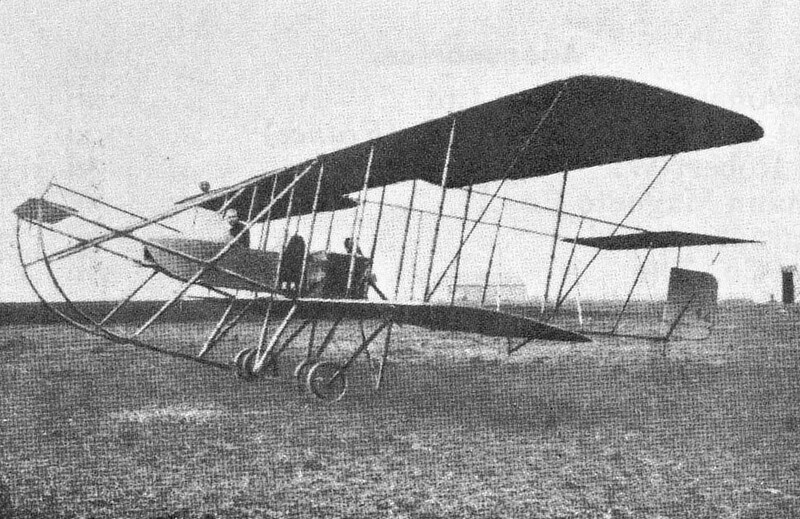 AVRO (1906). This 24 h.p. 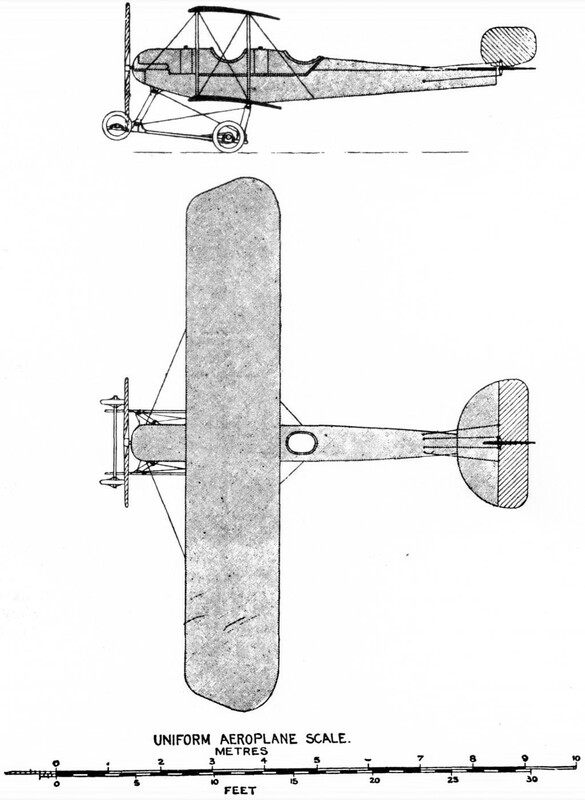 biplane, designed by A.V. 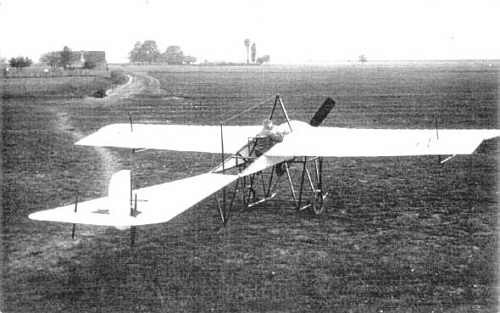 Roe, was the first British machine to leave the ground. 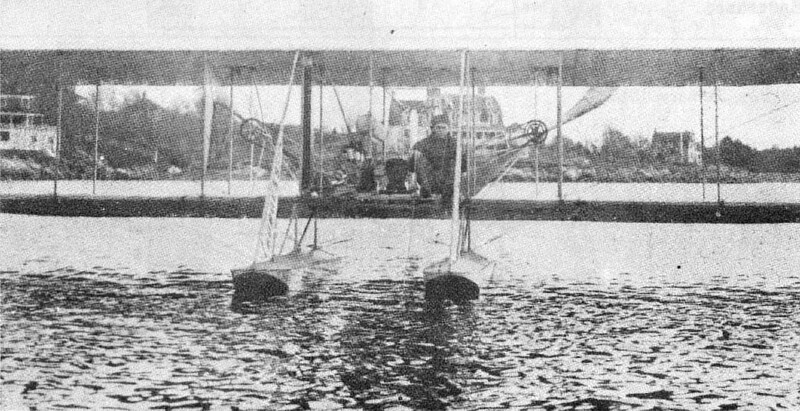 The Humphreys Waterplane, built at Wivenhoe, Essex, during 1908/9 by Mr Jack Humphreys, who is said to have been known locally as 'the mad dentist'. ELLEHAMMER (1905). 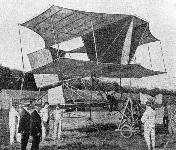 On 12th September, 1906, this machine made the first free flight in Europe. 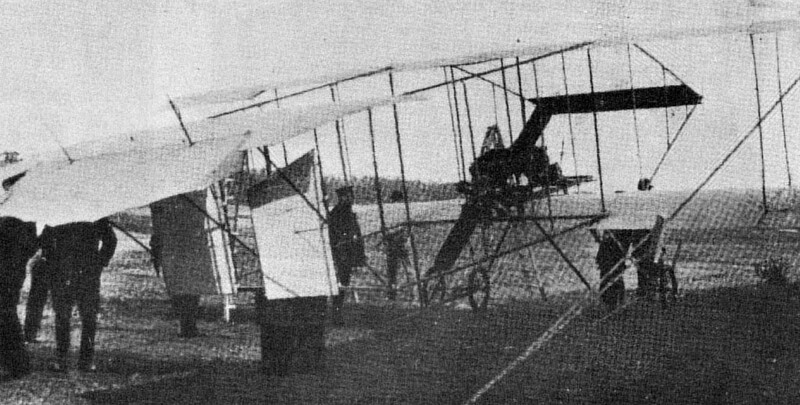 On 28th June, 1908, it won the prize at Kiel for the first flight in Germany (distance, 47 m.) It was a tractor biplane with a revolving Ellehammer motor. It also had a pendulum seat as a stabilising device. 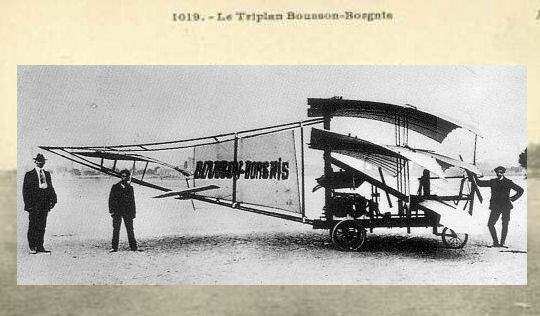 The big Bousson-Borgnis canard, the Auto-Aviateur of 1908. 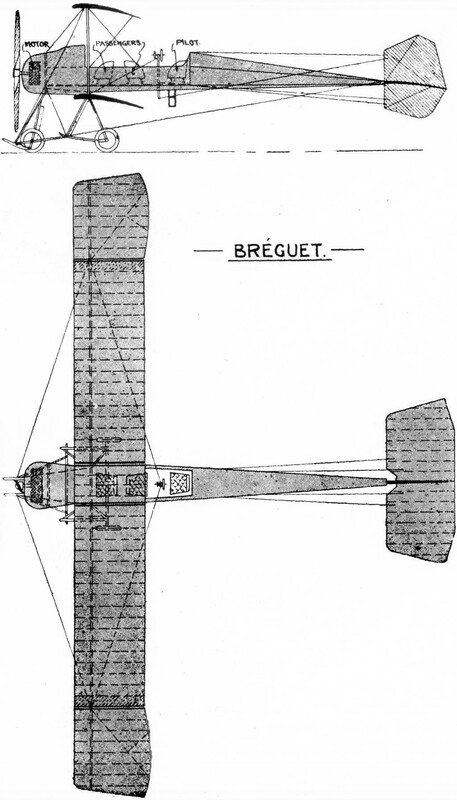 BREGUET (1906). 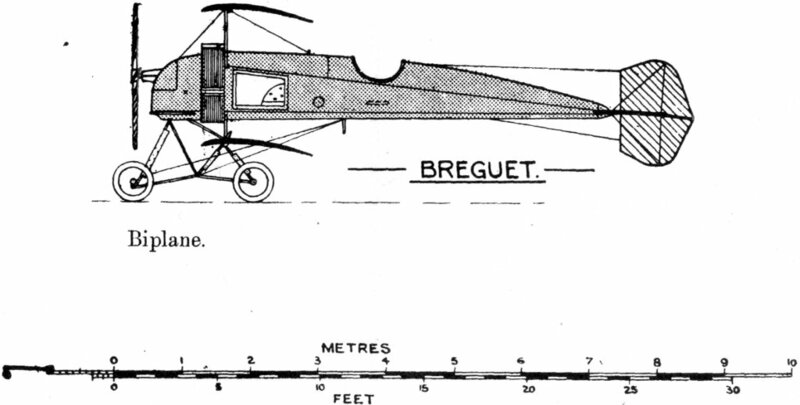 The first Breguet, known as Breguet Gyroplane I. 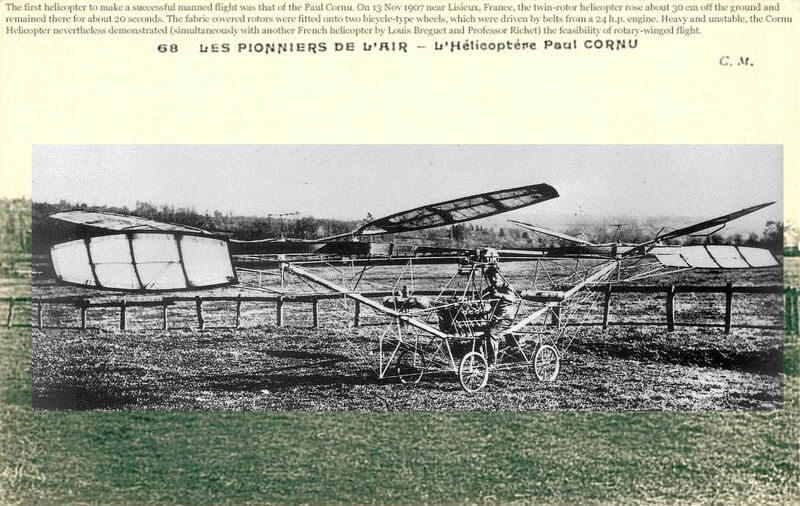 Made a flight in October, 1906, being the first helicopter to leave the ground. CHAUVIERE (1909-10). 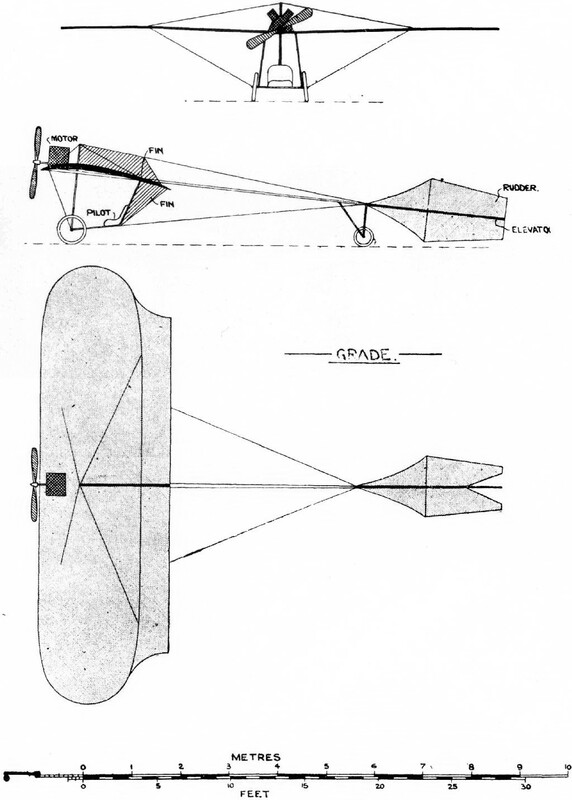 Attempt to develop a monoplane with propellers in rear. 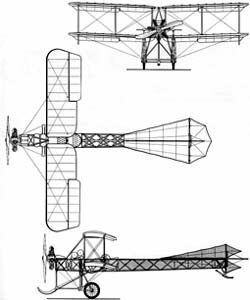 The idea has been resuscitated for some 1913 military monoplanes. D'EQUIVELLY (1907-08). Interesting example of the strange machines devised by pioneers. GIVAUDIN (1908-09). Built by the Vermorel Co. 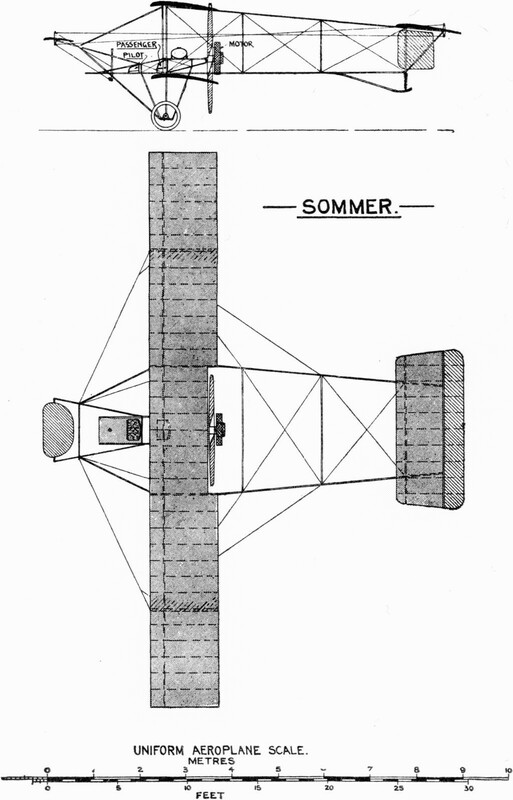 The first conception of an idea which has since attracted a certain class of inventor in Germany, Italy and the U.S.A.
MILITARY (1909). 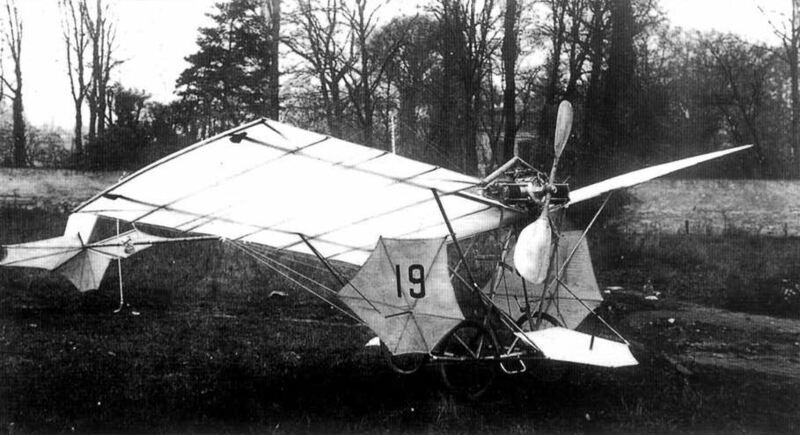 The first special military aeroplane ever built. It was specially designed by Capt. Dorand, for what were then held to be the aerial necessities of the French Army. The planes were placed well above the body, giving the pilot a very clear uninterrupted view. 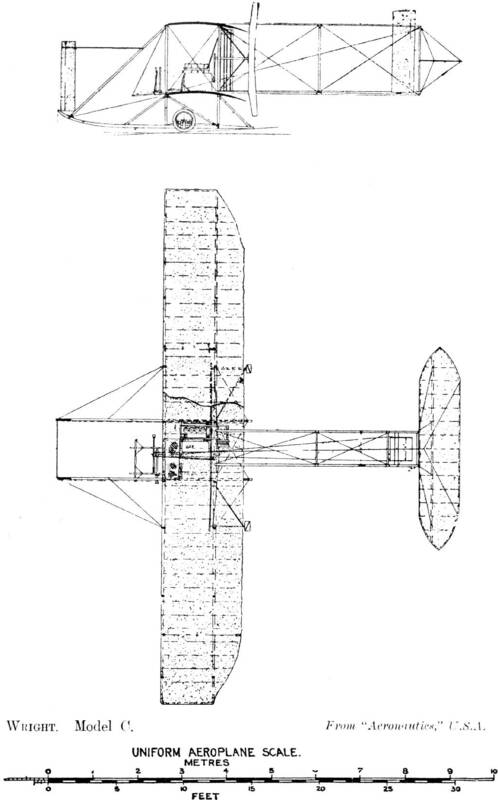 PISCHOFF-KOECHLIN (1908). 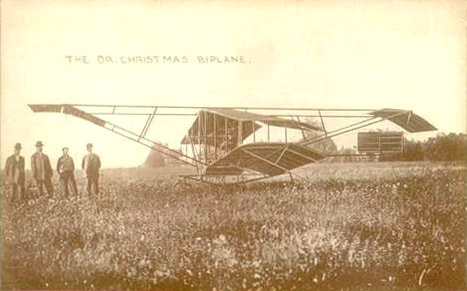 Very early example of a tractor biplane. The extra span of the upper plane is also of interest. 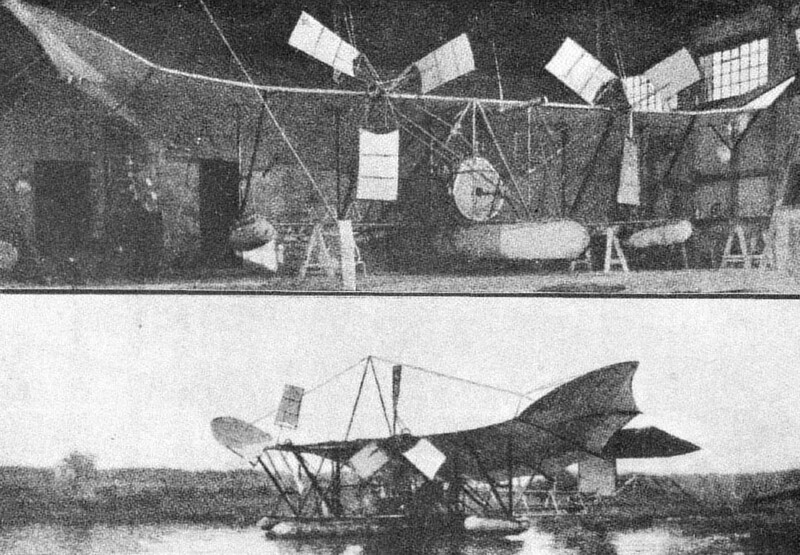 The machine had twin mono-elevators aft and also twin rudders. 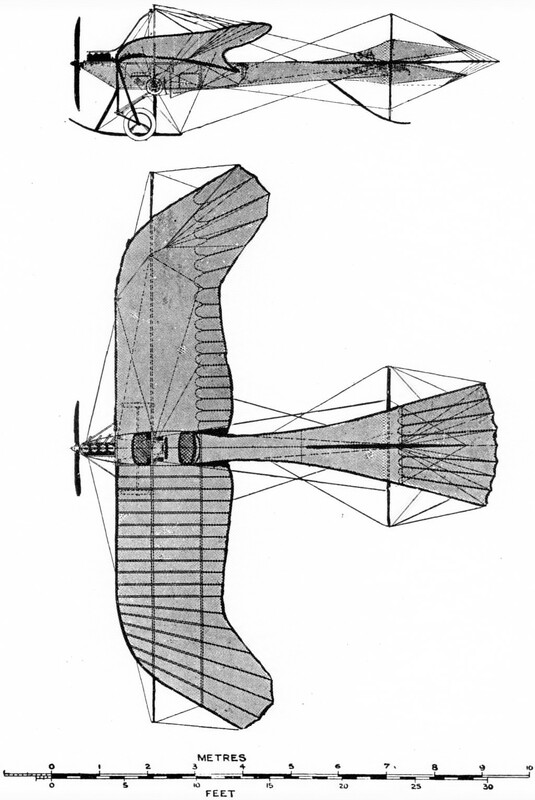 The Pischoff I biplane of 1907, though not quite a flyer, set the style of future biplanes with its clean configuration, uncluttered by forward control areas or box-kite cellules, its Chauviere Integrate tractor propeller making it what is now regarded as the first in Europe of a modern design. 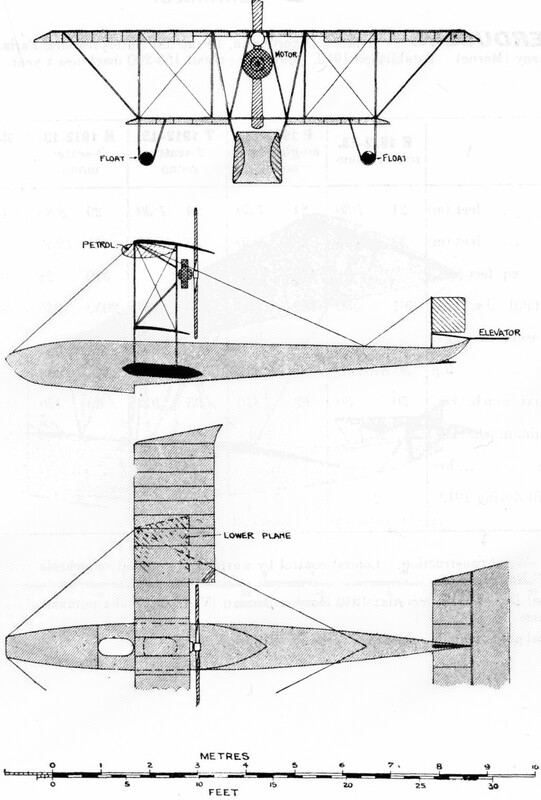 The tail unit was a Cayley-type cruciform union of tailplane, fin, elevator and rudder. There were no ailerons, no wing­warping, and consequently no pilot-operated lateral control. 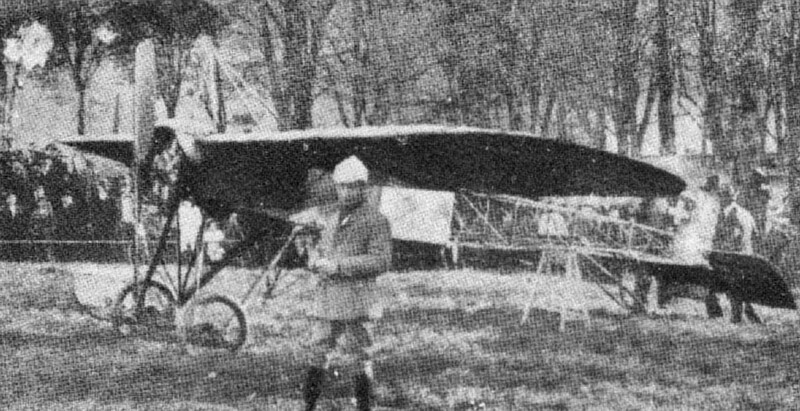 The Pischoff I introduced the famous Anzani engine into aeronautics. 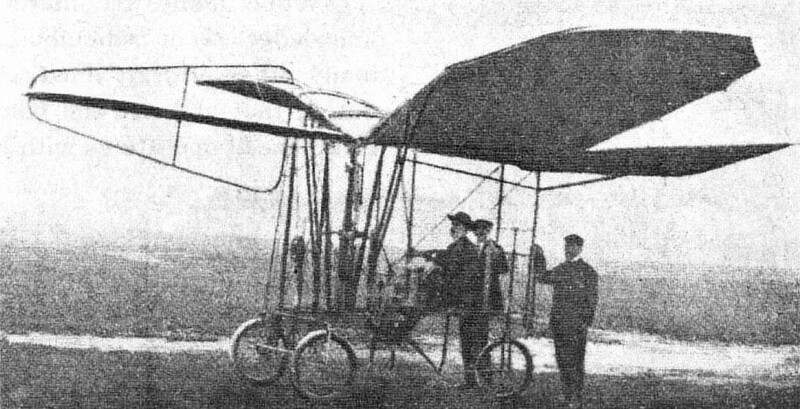 The second Vuia aeroplane, with a squared box frame. 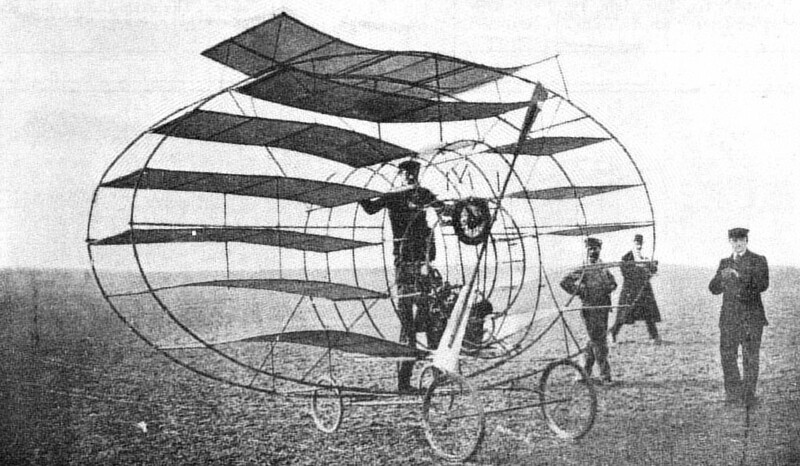 Earliest known machine with folding wings. BEILHARZ (1909). 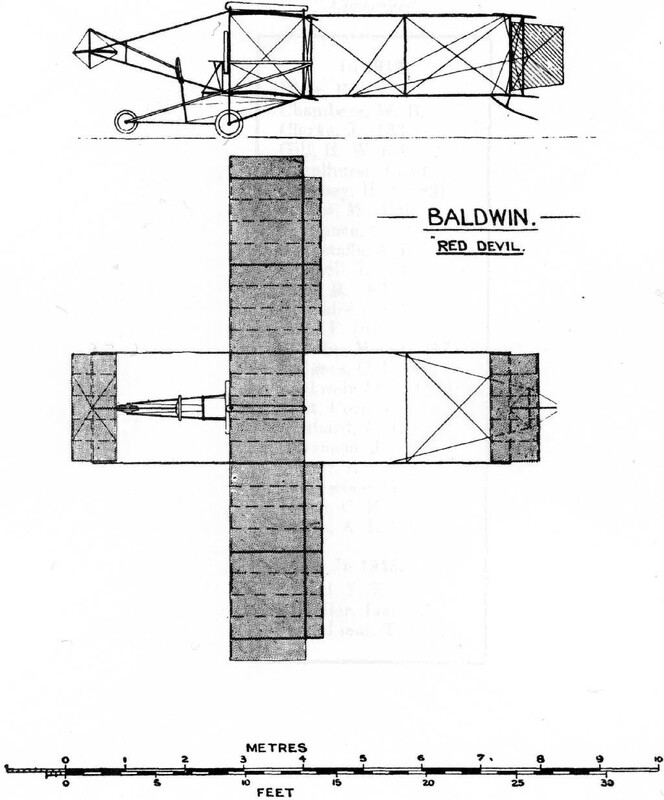 First design in which a completely closed in body figured. GRADE (1908). 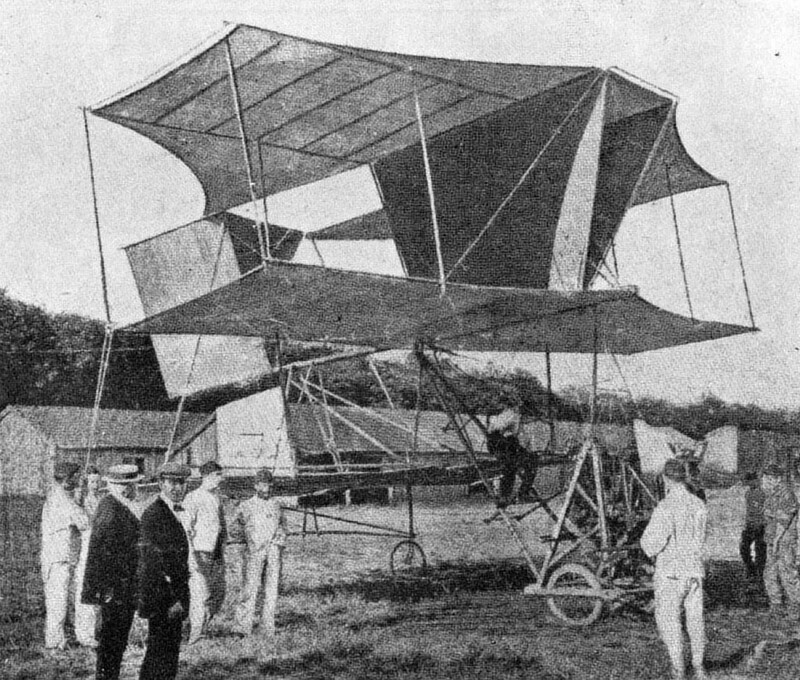 The first German built machine to fly. PARSEVAL (1909). 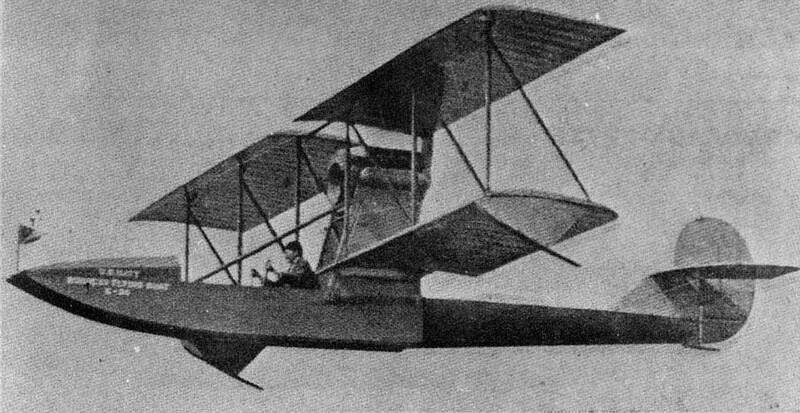 Early hydro-aeroplane. Spedially designed for military purposes by Major Parseval. SCHOLTZ (1908). Never left the ground. DUFAUX (1908-09). First Swiss machine. ENGLISH (1909). In 1909 extraordinary claims were made for this machine and great things expected. On a full power trial in its shed it broke loose, and smashed itself against the roof. No recorded outdoor results. HULBERT (1910). 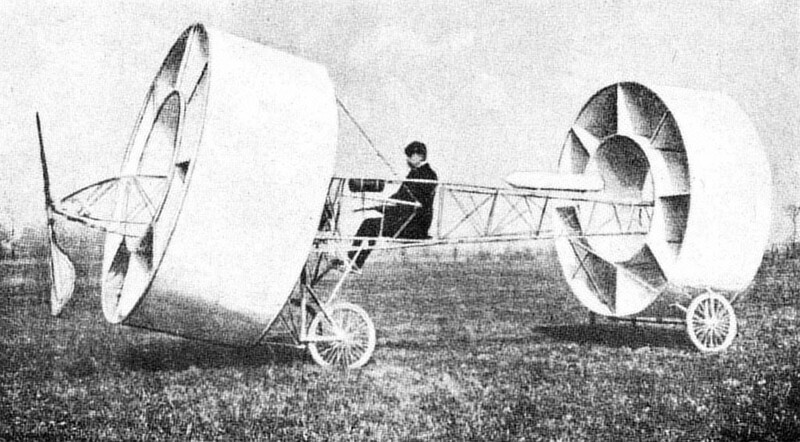 This strange machine built in Switzerland by Dr. Dane Hulbert, achieved several flights. The planes were placed longitudinally instead of in the usual way. MOISSANT (1910). Built entirely of aluminium. Designed by the late John Moissant. Failed. H. FARMAN (1908). 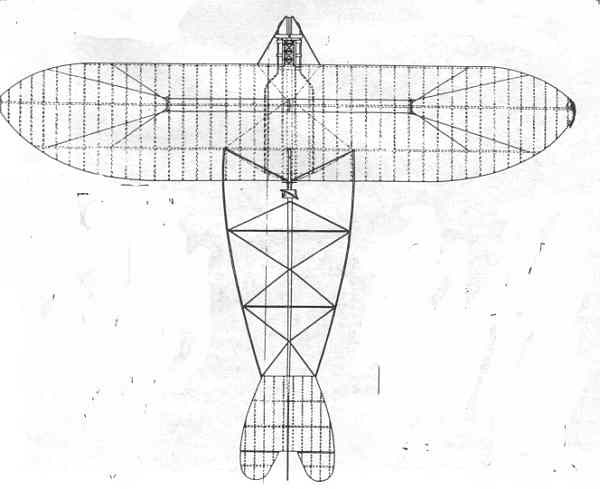 Farman's first idea of a monoplane. It proved too heavy to fly with the power provided. Was eventually sold to a German officer. 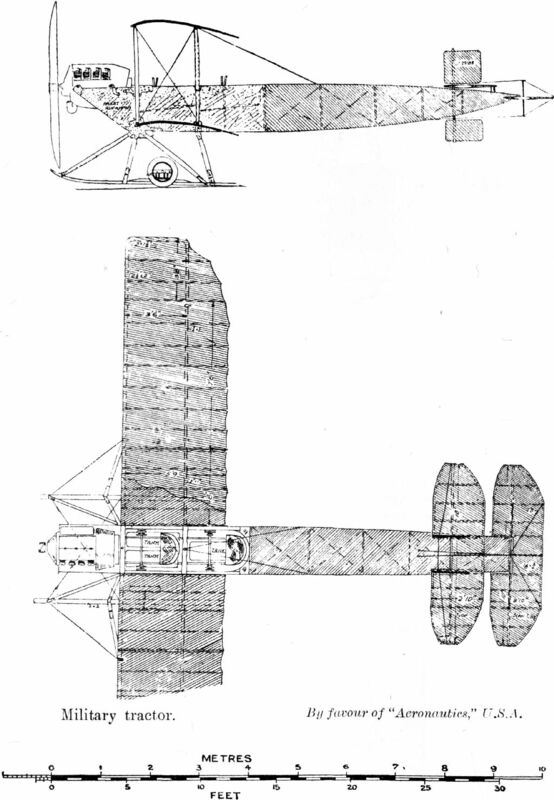 Three sets of wings and entirely enclosed body. PISCHOFF-KOECHLIN (1906 or earlier). 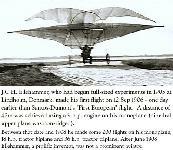 Dates from the days when a box-kite was the elementary idea in design, and the accepted position of the aviator lying prone. 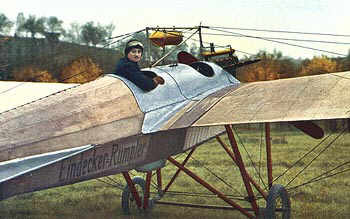 Rumpler. "Taube." With limousine body.